Figure 1: Anonymous, “A Compendium of Events and Record of the Rice Market from 1853 to 1868” (Ka’ei nenkan yori bei sōba nedan narabi ni nendaiki kakinuki daishinpan), n.d., but perhaps mid-1868. Source: Hachiro Yuasa Memorial Museum, ICU, Poking Fun, p. 7 (Click to enlarge, or see full size image here). Click here to see a full translation of this document. Walter Cronkite, You Are There, early television series. 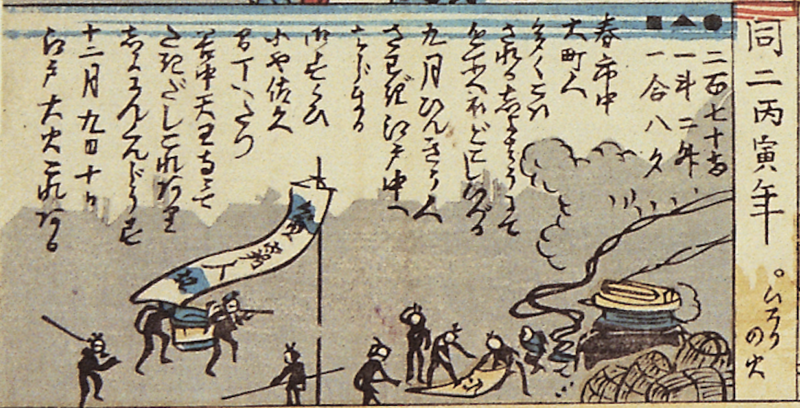 In the middle of 1868, a woodblock print was published in Osaka that chronicled the years leading to the collapse of the Tokugawa bakufu (Figure 1; see full translation here). 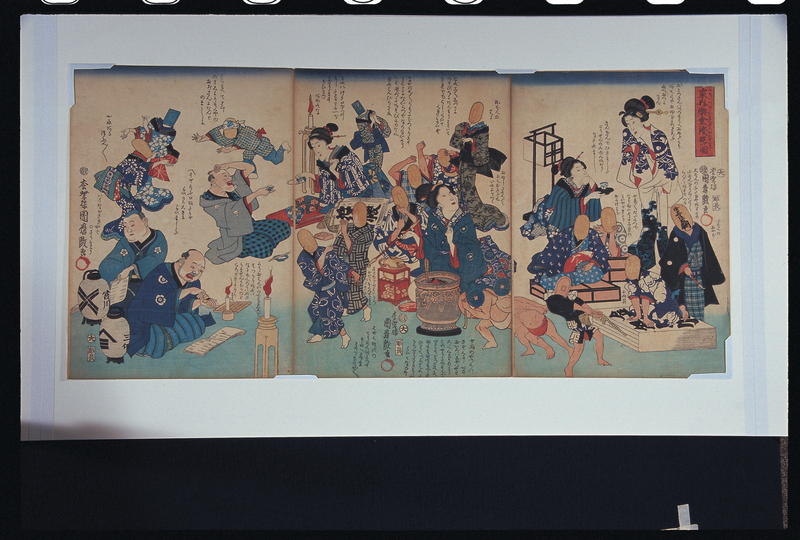 The print, entitled “A Compendium of Events and Record of the Rice Market from 1853 to 1868” (Ka’ei nenkan yori bei sōba nedan narabi ni nendaiki kakinuki daishinpan), is divided into 16 panels or boxes, one for each year between the intrusion of Commodore Matthew Perry in 1853 and the defeat of the Shōgitai at the Battle of Ueno Hill in 1868. Each box includes a list of major happenings for that year and a pictorial depiction of one of those events. In 1853, for example, the box includes a colorful depiction of a foreign ship, a visual reference to Perry’s black ships. 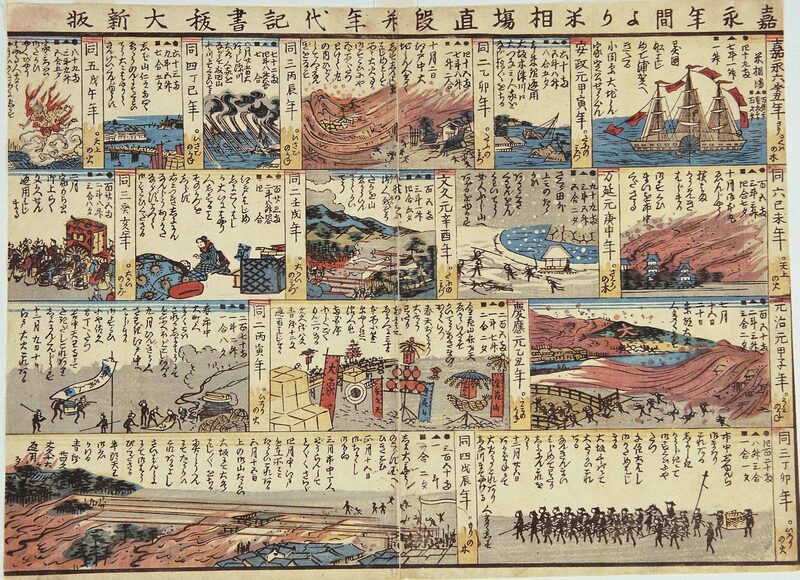 In addition to political events such as the assassination of Ii Naosuke (1860) and the procession of Shogun Iemochi to Kyoto (1863), the print depicts military skirmishes (1861, 1864, 1868), a tsunami (1854), an earthquake (1855), a flood (1856), religious festivals (1857, 1865), epidemics (1858, 1862), relief activities (1866), and fires, including the conflagration that destroyed the main keep of Edo Castle in 1859. 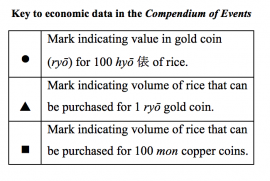 Rice market data is also given for each year, showing an abrupt decline in the buying power of copper coins in the years leading up to fall of the old regime. The Compendium of Events has not been the object of careful study. It was published by Kintakudō in Osaka. The artist is unknown; the date of issue may be assumed to be 1868, perhaps before the change in era names from Keiō to Meiji on the 28th day of the 9th month. Nonetheless, for its very anonymity, the print is an important historical document. As a cartography of time, it offers a glimpse into the way contemporary people understood and remembered the flow of events that led to what historians today call the Meiji Restoration. It is an alternative view of the bakumatsu years, especially interesting because it was compiled before the imperial side had fully succeeded in its attempt to create a new national government. Moreover, compared with existing textual accounts, the testimony of images found in the print’s visual narrative adds depth to our understanding of these dramatic years, replete with man-made and natural disasters and fears that the world that as people knew it was entering its final days. Naiyū gaikan (troubles from within, threats from without) described the reality of the age. Every picture tells a story. This visual essay inquires into which story, if any, is being told. Primary focus is fixed on the Compendium of Events, but reference is made to other contemporary visual and textual materials in order to more fully illustrate the lived history of the bakumatsu period. These images are good evidence of the heterogeneity of views and experiences that animated people in Japan in the middle of the nineteenth century, and allows us, as viewers of the past, to achieve a more vivid imagining of the chaos of those days. The layout of the Compendium of Events is immediately reminiscent of a sugoroku board game, with an obvious beginning (furidashi) and goal (agari). In this case, the year 1853 is the starting point and the defeat of the Shōgitai at Ueno Hill is the end point: the final demolition of the old regime. The chronology of events highlighted in the years in-between seemingly lack a clear rationale or narrative. As with many contemporary accounts, one event follows another with no apparent rhyme or reason, no distinction between human and natural affairs, and no indication of cause or effect. But whether this represents a mentality “in which things happen to people rather than one in which people do things” is open to question. On the one hand, the seemingly incoherent chronology recorded in the woodblock print, in both text and visual image, demonstrates how difficult it was for people at that time to make sense of the passage of time, so disrupted by events beyond their control. At the same time, however, the print reveals a somewhat ominous view of history—an apocalyptic confluence of natural, political, economic, and social disasters. Indeed, some order can be imposed on what otherwise seems historical mishmash. Of the total of 51 events listed in the print for the 16 years between 1853 and 1868, 17 refer primarily to political affairs, 12 to disasters including earthquakes, fires, and epidemics, 8 to economic matters, 6 to religions festivals, 4 to welfare activities, and 4 to social happenings such as the display of an elephant in downtown Edo. Naturally, such general categories (politics, disasters, economics, religion, welfare, and society) are prone to much overlap; for example, the attack on the imperial palace in 1864 (the so-called Incident at the Forbidden Gate) was carried out by pro-imperial loyalists, but remembered in the print more for the fire that destroyed much of the central district of Kyoto. Nonetheless, what follows is an examination and discussion of the events recorded in the print by category, beginning with the political (closest to what is often considered the “usual” story) and ending with the attention paid to disasters (perhaps, for us, the most “unusual” story). Special attention will be given to the print’s complex matrix of images that constitute a visual lexicon of the bakumatsu years. Figure 2: 1853 (Kaei 6 Kichō) Kuwa no ki (Mulberry bush). Foreign Ships arrive in Uraga (inside Edo Bay) for the first time. Detail of Figure 1 (Click to enlarge). 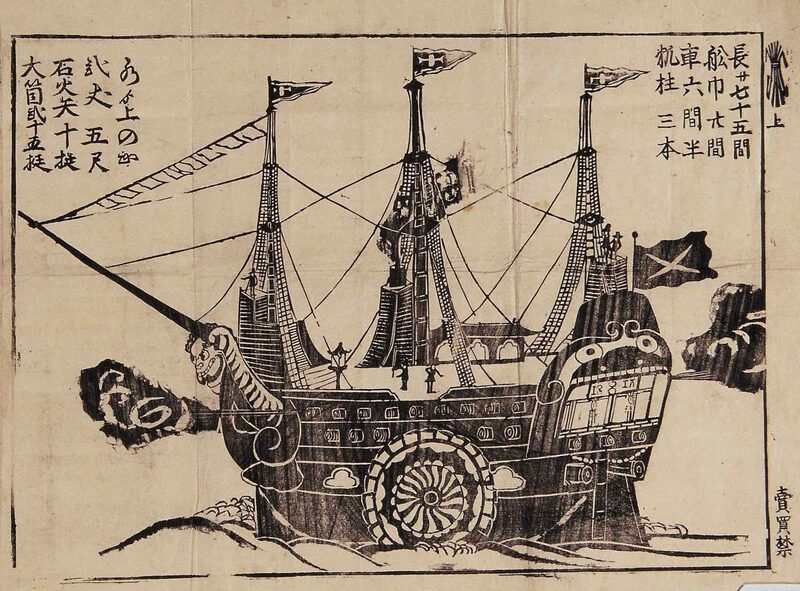 Figure 3: Kawaraban: A Black Ship, 1853. Source: Hachirō Yuasa Memorial Museum, Poking Fun, p. 2. (Click to enlarge, or see full image here). Commodore Perry and his “black ships” appeared in Edo Bay in the summer of 1853 and once again in the spring of 1854, initiating changes that would radically transform Japanese foreign and domestic policy. Edo commoners were naturally curious to learn about these aliens who suddenly appeared within sight of their city. Over 500 monochrome woodblock prints known as kawaraban appeared on the streets of Edo for sale during this time. Although filled with inaccurate information, these crude prints gave the commoners their first detailed view of the world outside Japan. They also served as a stimulus for popular national consciousness. Perry and his black ships were portrayed as the beginning of the end of Tokugawa rule. An American warship had entered Edo Bay earlier in 1846, but Captain James Biddle was easily turned away and the event left little impact on popular memory. A show of force by Naval Commander James Glynn to Nagasaki in 1849 proved successful in repatriating some 13 American seamen in Japanese custody, but this event was also quickly forgotten in both Japan and the United States. Perry and his black ships were different. At full force, the 1853-54 expedition consisted of 9 vessels, around 150 cannon, and more than 1600 men; it was unprecedented in the number of men and munitions mustered in peacetime for the purposes of diplomacy. The illustration of the foreign paddlewheel steam ship in the upper right-hand corner of the print, the starting point, may not appear menacing. (Figure 2) There is no billowing black smoke, no visible cannon, and no indication of national origin. But it symbolized the reality of the foreign threat that had troubled Japan’s political and intellectual elite from the early nineteenth century. 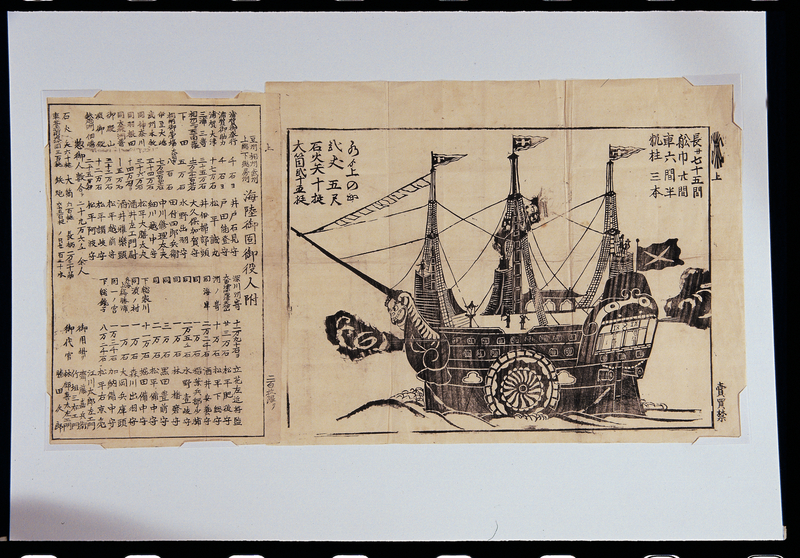 Very likely it was drawn in imitation of the many black ship broadsheets (kawaraban) that appeared for sale on the streets of Edo shortly after Perry’s arrival in Uraga on the 3rd day of the 6th month (July 8), 1853. (Figure 3) The popular crude woodblock prints were designed to exploit the curiosity of the Edo commoners as well as to allay their fears. With the help of kawaraban and other social media, including word of mouth, news of Perry and the black ships quickly spread throughout Japan. Perry’s visit was thus a national event well befitting the beginning of a new era. Reports of a major earthquake that struck months before Perry’s arrival, in Odawara on the 2nd day of the 2nd month, 1853 and news of the appointment of Tokugawa Iesada as shogun, following the sudden death of his father on the 22nd day of the 6th month, during the height of the Perry crisis, added to this sense of a new beginning. But the beginning of what? Aside from attention given to the appearance of foreign ships in 1853 and the opening of Yokohama to trade (Figure 4), the Compendium of Events made little mention of international affairs. Events relating to domestic politics were similarly fragmented. Shogun Iesada’s death was reported in 1858 but the event was secondary in importance to the cholera epidemic that swept through Japan in the same year. 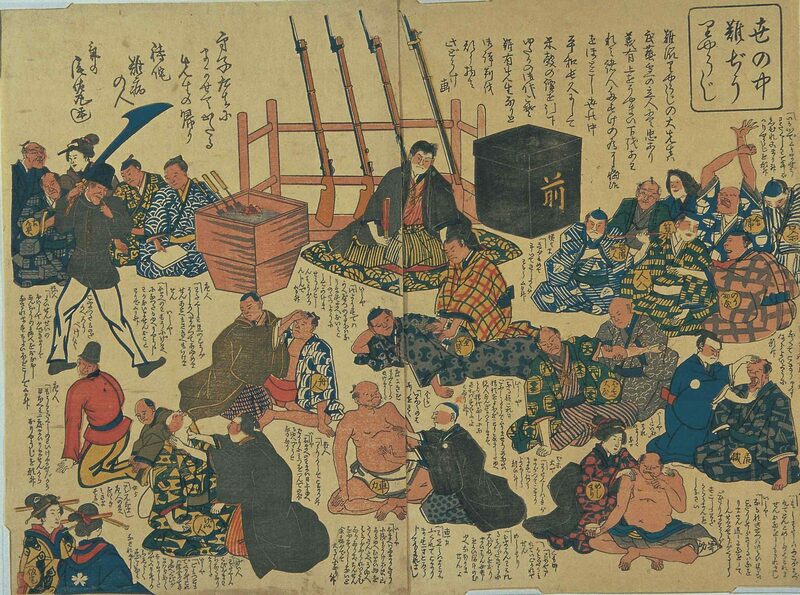 The illustrated chronology made no mention of the messy succession dispute that followed the death of Iesada in 1858 nor of the reign of terror, the so-called Ansei purge, conducted by the new shogun’s chief senior councilor Ii Naosuke in 1859. But the dramatic assassination of Ii, on the 3rd day of the 3rd month, was depicted as the central event of 1860. 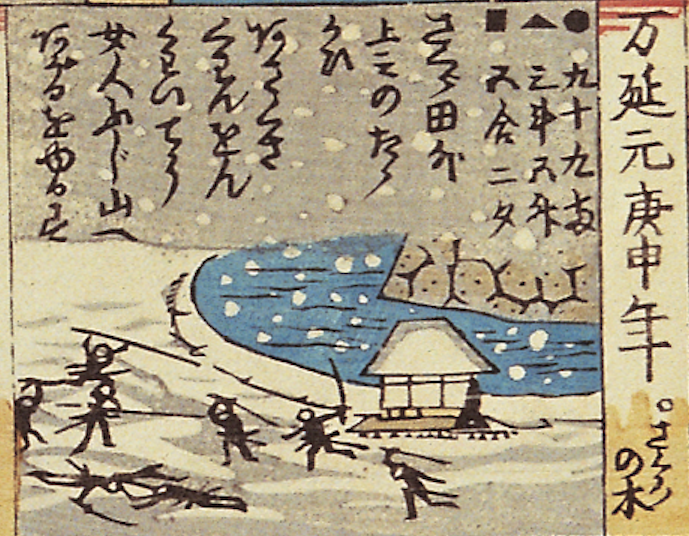 Snow falls on banks of the moat surrounding Edo Castle near the Sakurada Gate as a group of 17 men from Mito and one from Satsuma cut down the man who had been labeled by his enemies as a tyrant. (Figure 5) While the terrorist attack shocked and fascinated the Edo populace, it would seem that another major event of 1860, the bakufu’s mission to the United States to sign the Treaty of Amity and Commerce, was of lesser importance. It was not included in the chronology. Figure 4: Opening of Yokohama to Foreign Trade. Yoshikazu, “Picture of the Landing of Foreigners of the Five Nations in Yokohama,” 1861. Source: Hachirō Yuasa Memorial Museum (Click to enlarge, or see full image here). The five countries, America, England, France, the Netherlands, and Russia, are each indicated by their national flag. Two Chinese are in the center of the picture; as in other treaty ports in Asia, these compradors were essential in facilitating trade with native merchants. Interestingly, the image focuses on the military rather the commercial presence of foreigners in Japan. On the other hand, the outbreak of hostilities led by anti-foreign, anti-Tokugawa insurgents from Mito in the spring of 1861 in Shimōsa Province (present-day Chiba Prefecture) was depicted as the major event for that year. (Figure 6) The incident, absent from most present-day historical accounts, began on the 17th day of the 1st month of Bunkyū 1 (1861) in Sawara. Ronin from Mito and elsewhere, proclaiming their desire to “revere the emperor and expel the barbarian” (sonnō jōi) attempted to extort money from wealthy merchants and farmers. The men were likely associated with the assassination of Ii Naosuke and with the murder of Townsend Harris’ secretary and interpreter, Henry Heuskin, in late 1860 and later, on the 28th day of the 5th month with the attack on the British Legation in Edo. In other words, the hard-fought and bloody skirmish at Sawara denoted the beginning of what would become a prolonged civil war between Tokugawa and imperial supporters. Figure 5: 1860 (Man’en 1 Kōshin) Sakura no ki (The Cherry Tree). 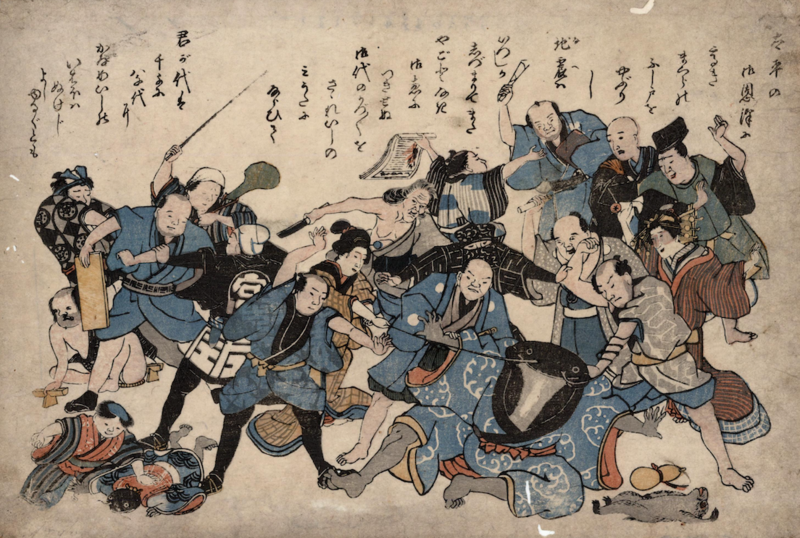 Battle at the Sakurada Gate on the 3rd day of the 3rd month (in which the chief senior councillor of the Tokugawa bakufu, Ii Naosuke, was assassinated). Detail of Figure 1 (Click to enlarge). Figure 6: 1861 (Bunkyū 1 Shinyū) Tani no mizu (Water in the Valley). 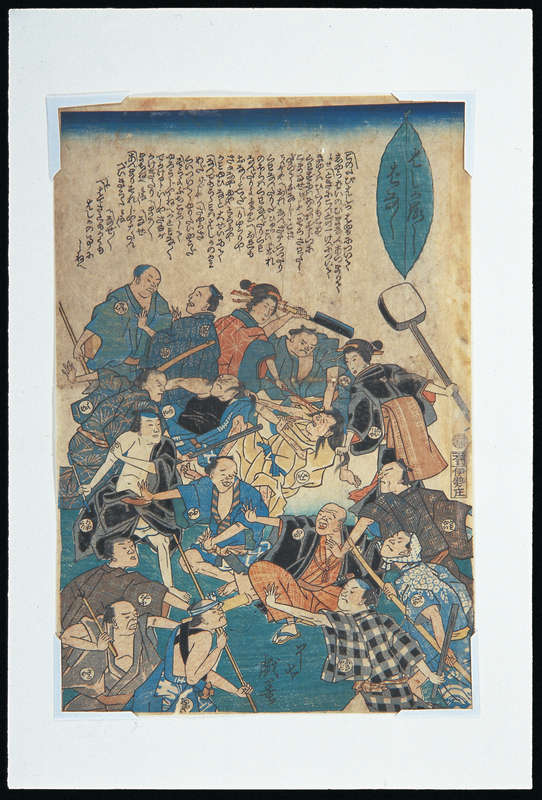 Outbreak of fighting by rōnin insurgents in Shimōtsuke Province. Detail of Figure 1 (Click to enlarge). Figure 7: 1863 (Bunkyū 3 Kigai) O-umi no mizu (Water in the Ocean) Shogun Iemochi travels to Kyoto in the 2nd month. Detail of Figure 1 (Click to enlarge). 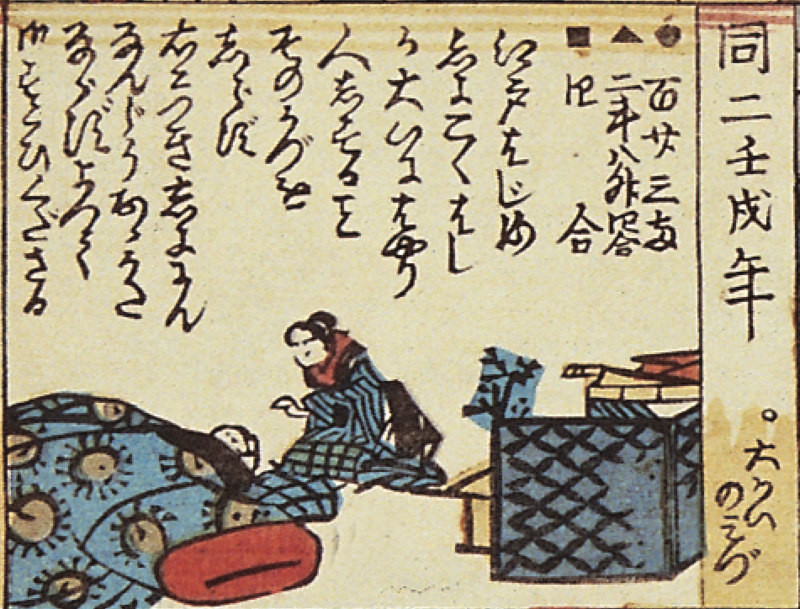 Figure 8: “Curing the Difficult Diseases that Confront Our World, 1863.” Source: Hachirō Yuasa Memorial Museum, Poking Fun, p. 16 (Click to enlarge, or view full image here). 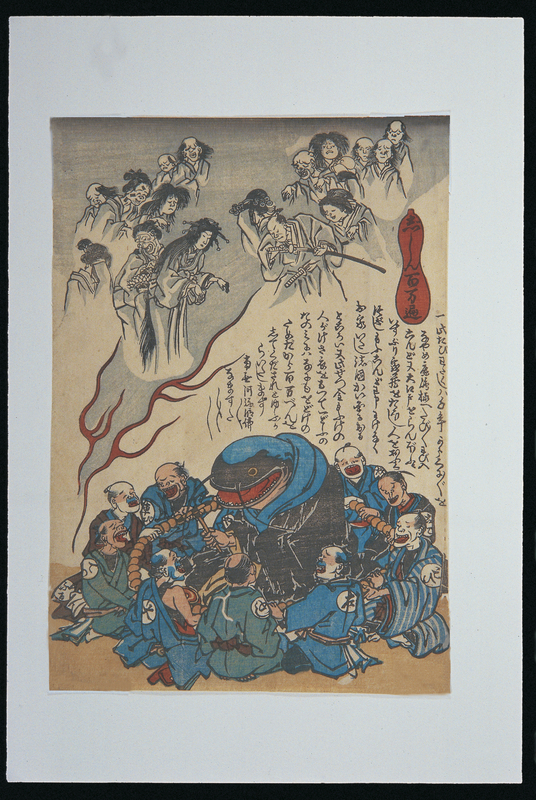 This “panic print” offers satirical comments on problems experienced by Edo commoners in 1863. It takes the form of a parody of a famous satirical print by Kuniyoshi: “A Marvelous Doctor Treating Serious Diseases” (1850). As in the original; a doctor and his assistants attempt to cure various ills of the day. In this print, however, the real doctor is absent and a substitute and his surrogates are called in to handle the caseload. The absent doctor refers to Shogun Iemochi who has left Edo for Kyoto. And the patients who seek help are cart pullers, porters, shippers, landlords outside of Edo and others who have suddenly profited from the mass exodus from Edo in response to rumors of war. Cart pullers, for example, complain of stomach troubles; they spent their sudden wealth on fancy food. Other patients, such as geisha and money lenders, seek help from sudden impoverishment. Two foreigners also seek help. One complains that he can’t move forward or backwards because his feet are pointed in opposite directions. The doctor tells him that there is no cure. Another foreigner fears that he will be forced to leave Japan and never return. Again, no cure! Figure 9: 1864 (Ganji 1 Kasshi) Umi no kane (Gold in the Sea). Great fire in Kyoto between the 15th day of the 7th month and the 20th day; many people die. Detail of Figure 1 (Click to enlarge). The Compendium of Events failed to mention the deepening civil war between Tokugawa supporters and its enemies, with Chōshū domain in the lead. 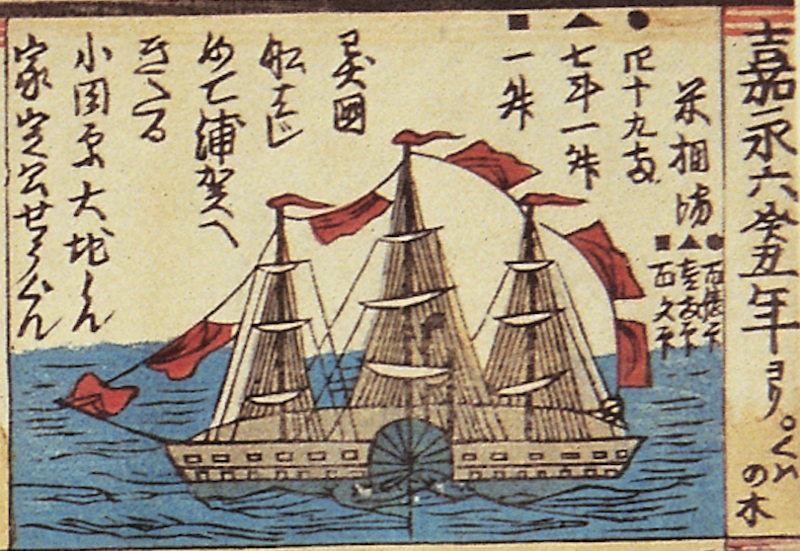 The first campaign against Chōshū was launched in late summer, 1864, soon after the Forbidden Gate Incident; a second expedition began in the spring of the next year. 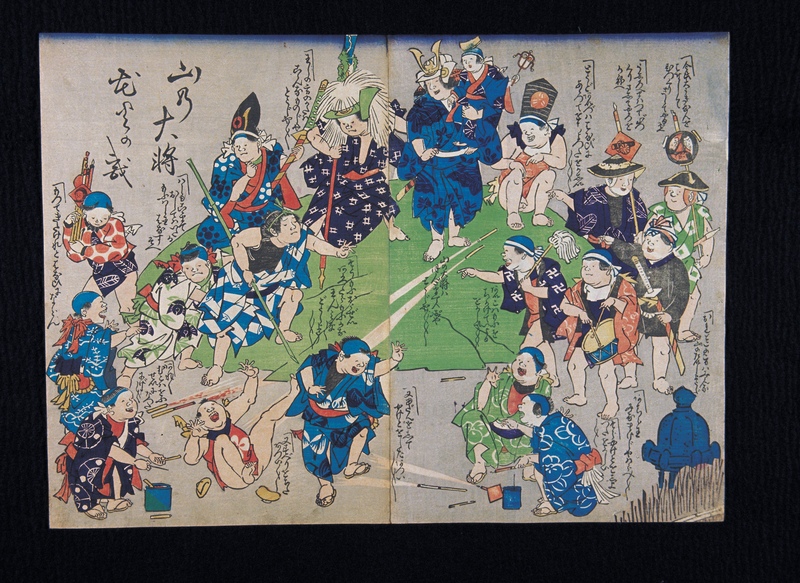 The illustrated chronology for 1865, Keiō 1, focused instead on the breakdown of law and order in Edo, much of the unrest caused by economic dislocations, including the imposition of an extraordinary levy on the townspeople of Edo to cover the expenses of the expeditions. Ronin insurgents were reported to have taken up residence in the vacant Ogasawara mansion in Honjo, on the east bank of the Sumida River, just north of Ryogoku. Moreover, two gokumon were set up at Ryōgoku Hirokōji for the public display of severed heads—primarily those of captured sonnō jōi provocateurs. This did little, however, to restore popular confidence in the ability of the Tokugawa government to bring back the peace, stability and prosperity of the recent past. The next year, 1866, proved even worse: bankruptcy, robbery and murder, and ultimately rioting in the streets of Edo dominated the news for the year. 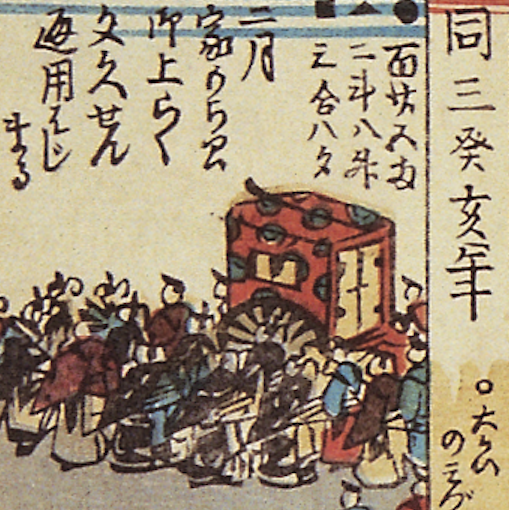 Inflammatory posters pointed the finger at the bakufu for failing to come to the aid of the people: “Due to High Prices, Goods are in Short Supply, and Able Officials are All Sold Out.” A change in leadership, not reported in the woodblock print chronology, failed to restore popular trust in government. Shogun Iemochi died in Osaka on the 20th day of the 7th month,1866, just as mass rioting was breaking out in the hinterland north of Edo. He was replaced by Yoshinobu, destined to be the last of the Tokugawa shoguns. At the very end of Keio 2, on the 25th day of the 12th month (January 30, 1867), Emperor Kōmei passed from the scene, replaced by the young prince Mutsuhito, the future Emperor Meiji. In effect the stage was set for the final act of the bakumatsu drama. Figure 10: 1867 (Keio 3 Teibō) Irori no hi (Fire in the Hearth). Police patrol the streets of the city (Edo). Detail of Figure 1 (Click to enlarge). Figure 11: Festival for the Gods of Happiness, 1867. Source: Hachirō Yuasa Memorial Museum, Poking Fun, p. 18 (Click to enlarge, or view full image here). By the end of 1867, civil war, foreign threats, poor harvests, and rapid rises in commodity prices were causing significant social unrest. In the desperate hope for better times, many commoners participated in a frenzied dance craze, shouting out ee ja nai ka (What the hell! ).” This print depicts the dreams of commoners, who hope that the gods of happiness and fortune will come to their rescue and shower them with money and lucky charms. Ominously, Mt. Fuji in the background appears ready to erupt. Figure 13: 1868 (Keio 4 Boshin) Mori no ki (The Tree in the Forest). On the 15th day of the 5th month, the battle at Ueno Hill. Detail of Figure 1 (Click to enlarge). Figure 12: The Romance of the three Kingdoms and the Magic Fox, 1868. Source: Hachirō Yuasa Memorial Museum, Poking Fun, p. 27 (Click to enlarge, or view full image here). 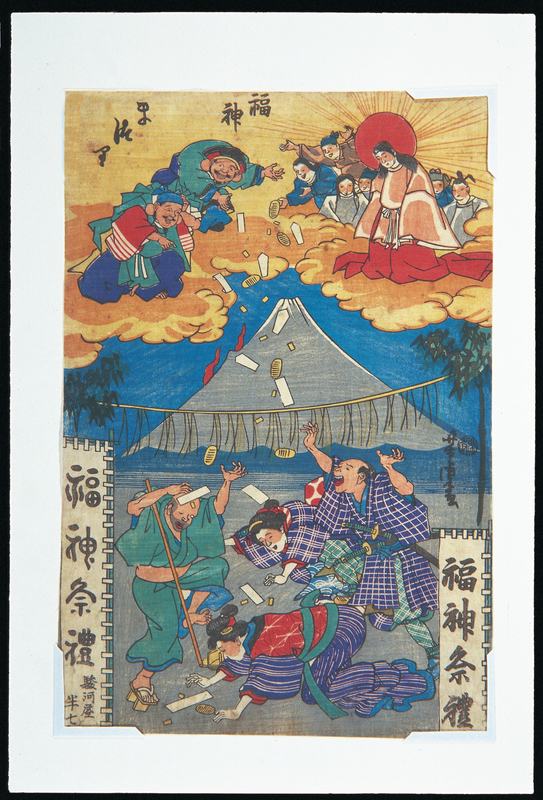 Figure 14: Children Playing King of the Mountain and Setting off Fireworks. Source: Hachiro Yuasa Memorial Museum, ICU, Poking Fun, p. 60 (Click to enlarge, or visit full image here). 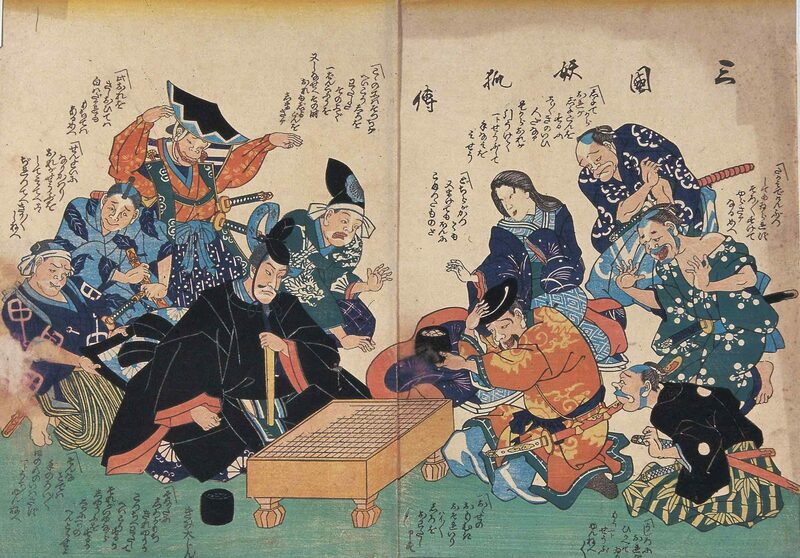 King of the Mountain was a common children’s game that was easily used to depict the victory over pro-Tokugawa loyalists known as the Shōgitai. 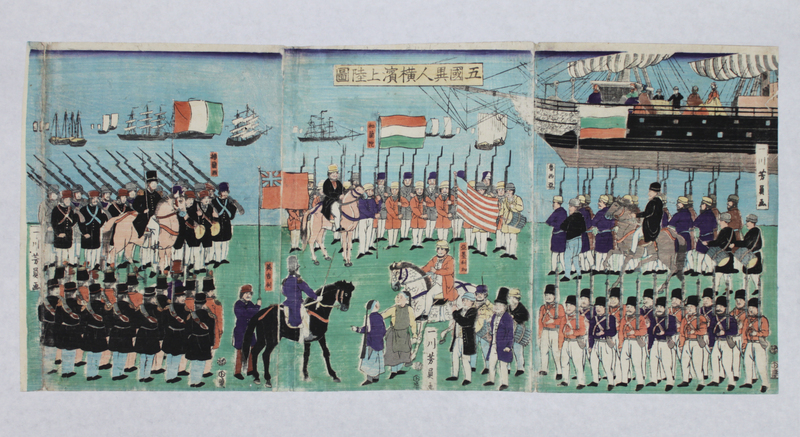 This print was probably issued soon after the decisive Battle of Ueno Hill on the 15th day of the 5th month, 1868. The battle resulted in undisputed control of the entire city of Edo by the Imperial Army. 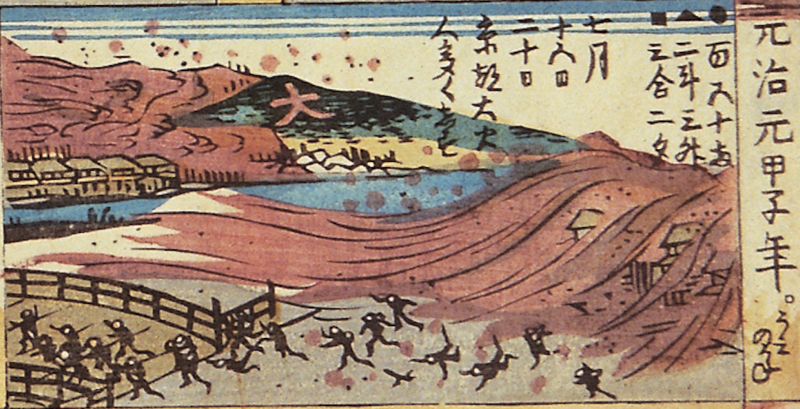 In this print, the leaders of Satsuma and Chōshū domains fight their way to the top of the hill. The Chōshū commander was Ōmura Masujirō. He holds the boy emperor aloft and proclaims victory as “King of the Mountain.” The battle was decided by superior firepower, especially the use of Armstrong cannon. The firecrackers surely made people recall the roar of the cannon, the barrage of rife shots, and the ensuing fire that engulfed the northeastern section of Edo on that fateful summer day. A new city government, the Saibansho, was set up after the battle; new government troops patrolled the streets and attempted to restore law and order. But while decisive in securing imperial control over Edo, the defeat of the Shōgitai did not guarantee control over all of Japan. Just before the battle, on the 3rd day of the 5th month, some 25 northeastern domains entered into an alliance opposing the new government. Hence the entry “Reports of fighting in northern Japan.” For the readers of the Compendium of Events there seemed to be no hope for the future. Unbeknownst to them, Edo would be renamed Tokyo on the 7th month, a new era name, Meiji, would be proclaimed in the 9th month, and the new emperor would take up residence in Tokyo on the 12th day of the 10th month. The civil war, however, would end only after the defeat of Enomoto Takeaki and other pro-Tokugawa holdouts at Hakodate on the 18th day of the 5th month, 1869. The Compendium of Events paid special attention to changes in the economy after the arrival of Commodore Perry in 1853. 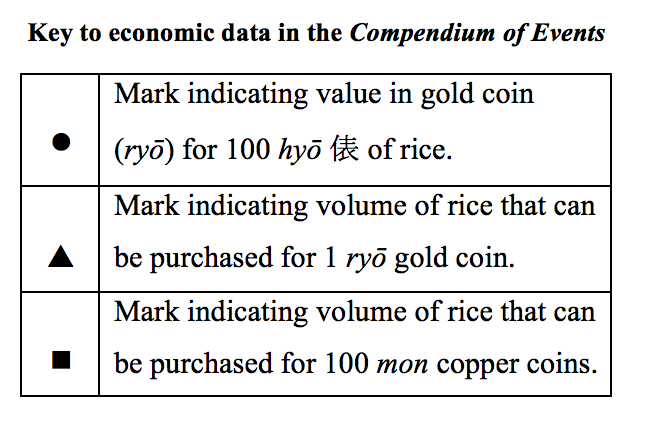 Each panel included rice market data: the price of 100 hyō of rice, the amount of rice one ryō of gold could buy, and how much rice 100 mon of copper, the currency of the commoners, could buy. A key to the data was given in the first panel, the 1853 arrival of a foreign ship (see key). In all cases, the figures pointed to economic meltdown (See Chart 1 and Graph 1, click to enlarge). Issued in Osaka, Japan’s financial center, the print may well have reflected merchant concerns, but more likely the story of skyrocketing prices, currency devaluations, and increasing levels of poverty reflected the increasing economic difficulties of ordinary people. The dramatic rise in commodity prices, especially after the opening of Yokohama to foreign trade on the 5th day of the 6th month (July 4), 1859, made it ever more difficult to buy the essentials of daily life (See Chart 2, click to enlarge). These economic woes, more than the political machinations of their samurai superiors, constituted the lived experience of the majority of Japanese during the bakumatsu years. As can be seen from the charts and graph, economic conditions for urban commoners worsened significantly during the years leading up to the collapse of the Tokugawa government. In 1853, 49 ryō in gold bought 100 hyō (bales) of rice; the same 100 bales of rice cost 350 ryō in 1868, down from the 450 ryō required in 1867; in 1853 one ryō of gold could buy 7.1 to (just under 1 koku) of rice, but in 1868 one ryō bought only 1 to of rice. 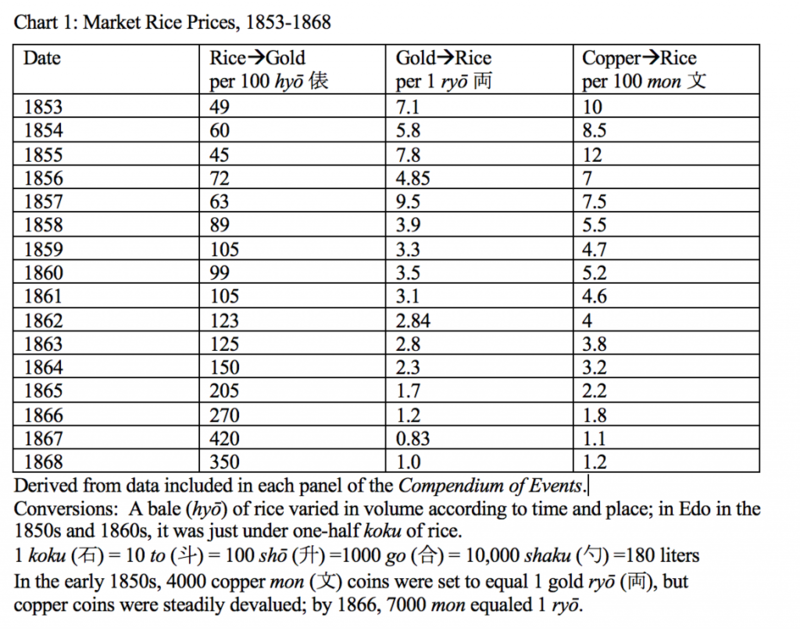 And, reflecting the economic plight of the lower classes, the buying power of copper currency declined precipitously: in 1853, 100 mon could buy 10 go of rice, (enough to feed one person for two days), but in 1868 the same 100 mon would only buy 1.2 go, barely enough for survival. 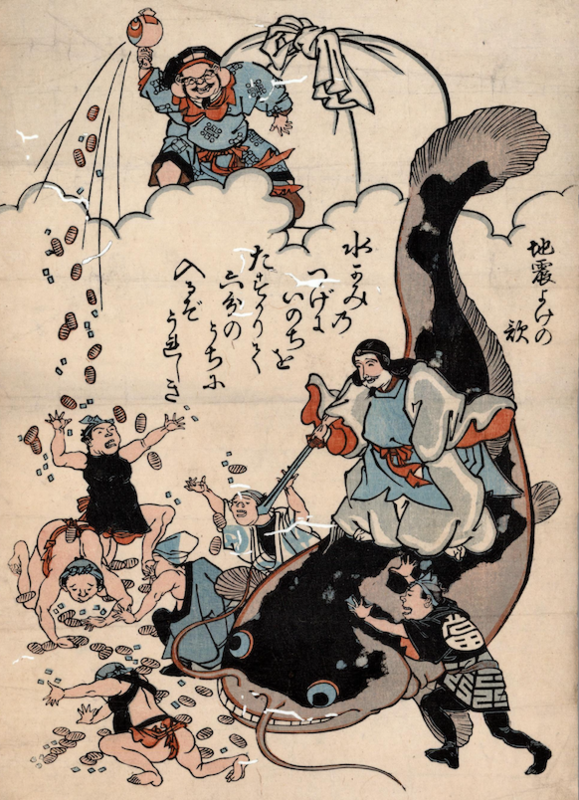 Figure 15: Domestic Gold and Silver in Happy Play (Freefall), Utagawa Kunimaru, 1865. Source: Hachirō Yuasa Memorial Museum, ICU, Poking Fun, p. 17 (Click to enlarge, or see full image here). This print takes an ironic look at the severe dislocations that plagued the Japanese economy after it was exposed to international trade. Whereas the domestic exchange rate between gold and silver was 1:5, the international rate was 1:15. In the 1860s, the Bakufu was forced to devalue its currency, leading to massive inflation. The print depicts these struggles between gold, silver and copper currencies and the attempts of dishonest merchants to profit from the currency crisis. Figure 16: 1866 (Keio 2 Heiin) Irori no hi (Fire in the Hearth). In Edo, poor camps established to alleviate poverty and hunger. One relief station is set up in Sakuma-chō (in Kanda area); cooked rice is distributed at Yanaka Tennōji Temple, crowds of people gather. Detail of Figure 1 (Click to enlarge). The Compendium made several references to new currency issues or changes in the value of existing currency, strategies traditionally employed by the Tokugawa government to increase its revenue. In 1854, for example, an item noted that the Isshū silver coin went into circulation. The coin, inferior in quality, was issued specifically to help pay for the construction of coastal defense facilities following the arrival of Perry. It was popularly known as “Odaiba-gin” because the coin, with a copper exchange value of 250 mon, was used as pay for one day’s work on the six island fortresses (diaba) off Shinagawa designed to protect Edo from attack by sea. Later, in 1863, the Bunkyū-sen copper coin (Bunkyū Eihō), valued at 4 mon, was reported to have gone into circulation—in fact some 3.38 billion coins were infused into the economy. 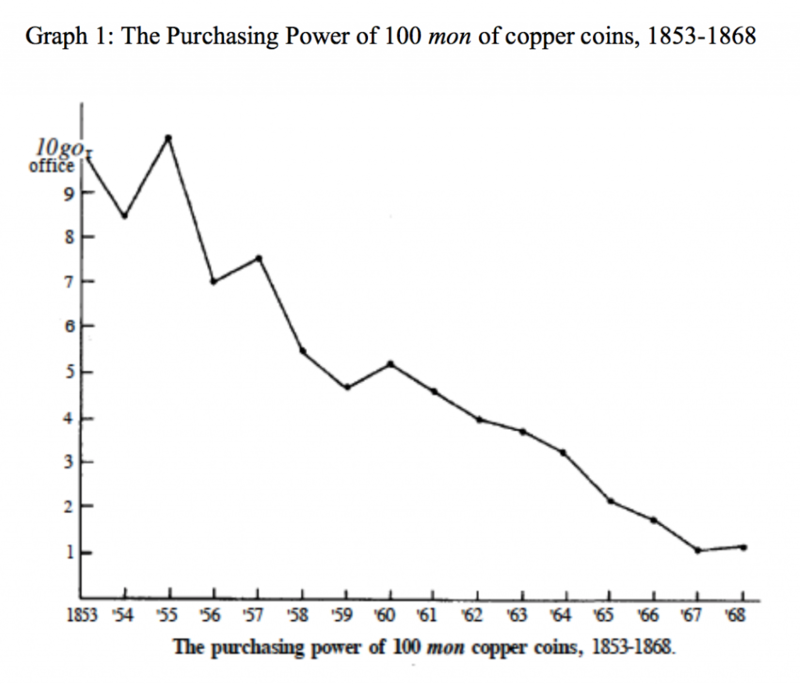 And adding to the currency chaos, in 1865 it was noted that 8 mon of Bunkyūsen coin would circulate as 12 mon of Aozeni coin (copper coins minted before 1863), and in 1868, as 16 mon, further debasing the value of the coin most commonly used by ordinary people. By the end of 1867, general impoverishment, caused by the rapid rises in commodity prices and poor harvests, were the cause of significant episodes of unrest. Established ways of life were in danger. Amid the confusion of the times, many commoners sought hope in new religions, folk cults, pilgrimages, or episodes of frenzied dancing and carnival-like behavior. According to George Wilson, the bakumatsu years witnessed an explosion of millennial hopes and dreams among Japan’s common people. New religions flourished, including Tenrikyō (founded in 1838), Kurozumikyō (1846) and Konkōkyō (1859), along with cults devoted to the worship of Maitreya (Miroku), the future Buddha, Mt. 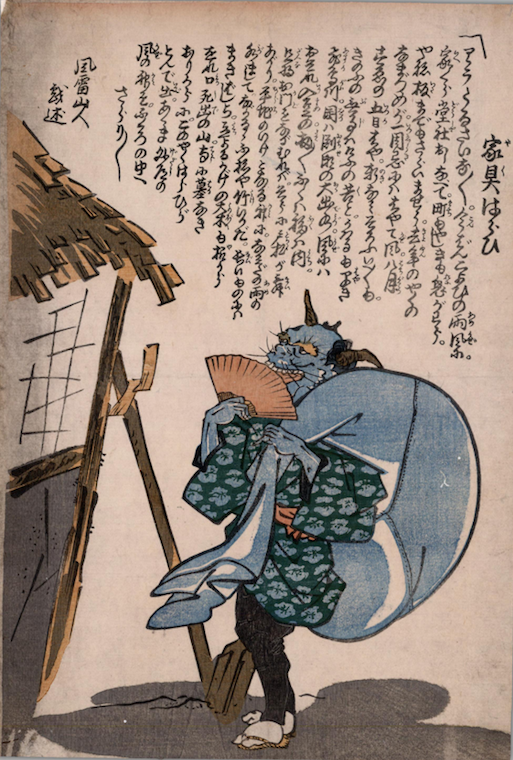 Fuji and the demonic Shōmen Kongō, a blue-faced deity with many arms associated with the Kōshin cult. Shunning established sects of Buddhism and Shinto, the new religions promised healing, salvation and renewal. And, to a certain extent, equality between the sexes. The Compendium of Events noted that in 1860 “women allowed to climb Mt. Fuji.” In fact, the prohibition against women climbers was only lifted after the Meiji Restoration in 1868. The year 1860 was a special exception; its sexagenary cycle was kōshin (the 57th year of the cycle) and known as the year of Miroku—a special year promising salvation. Among members of Fujiko confraternities, pilgrimages to climb Mt. Fuji on kōshin years were especially important. Thus in 1860, demand being so great, special permission was given to women to climb the mountain. The urge to construct a new order, a new world, also animated a sudden rise in rural and urban unrest in the 1860s, including rioting and bouts of property destruction, with over 100 separate incidents in 1866 alone. Yonaoshi (world renewal) was watchword of many of these uprisings. A broadsheet describing the 1866 Bushū outburst stressed that the farmers felt that they had no choice but to rise in rebellion: “All the villagers found it necessary to meet together and discuss their problem. They talked about the merchants who dealt in rice and other grains and traded with foreign countries, saying that if merchants from various provinces continued to profit in this way, the people will die from starvation. The people decided to risk their lives, wreck the house of the wealthy, and thereby get the prices of things to come down. … On a banner was drawn a rice bowl and crossed rice paddles. Underneath was written ‘Great God of World Renewal’ (yonaoshi daimyōjin). And with this flag in the lead, about 3,000 marched off.” Impelled in this way, these and other ordinary people desperately sought a means to mend an imperfect world. The Compendium of Events took note of rural and urban rioting but paid scant attention to informal religious concepts and practices associated with them. Nor did it mention the millenarian remaking of Japan envisioned by loyalist samurai, a sort of emperor-centered yonaoshi designed to wreck the bakufu and create a new imperial order. It did, however, focus on festive religious events known as kaichō, the public display of religious objects usually hidden from sight. Some temples held periodic displays of their own treasures, so-called igaichō, but more popular, especially in Edo, were degaichō, the hosting of a display of another temple’s icons and other objects infused with spiritual power. In Edo, Ekōin (on the eastern side of Ryōkoku Bridge) and other temples, including Asakusa Sensōji, were famous for such events, often lasting around 60 days. In addition to the display and veneration of religious items, carnival-like sideshows (misemono) in the form of teahouses, gaming booths, and kabuki performances, were held in conjunction, attracting crowds of pilgrims as well as people in search of cheap entertainment. Figure 17: 1857 (Ansei 4 Teishi) Isago no kane (Gold on the beach). Kaichō of Shibayama Nio held at Ekōin at Ryōgoku; crowds of people throng to the event. Detail of Figure 1 (Click to enlarge). The chronology took note of five such popular events: kaichō held in 1856 (for 60 days beginning on the 20th day of the 3rd month) at Fukagawa (Eidaiji Temple) of items from the Narita-san temple in Shimōsa province; in 1857 (for 60 days for the 16th day of the 4th month), the display at Ekōin of treasures from the Shibayama Nio-son Temple in Kazuka province; in 1860 (for 60 days from the 15th day of the 3rd month), the opportunity to see the image of the kannon (goddess of mercy) at Sensōji in Asakusa; in 1861 (for 60 days beginning on the 3rd day of the 3rd month), religious items were loaned from Takao-san (Jakkō-in) for display at Ekōin; and finally in 1865 (for 60 days from the 28th day of the 6th month), the exhibition of treasures from the Kinkazan Benzaiten (Rikuzen province), including a carved wooden image of Benzaiten, the goddess of water, art, music, and general good fortune. Illustrations of two of these kaichō, the 1857 Shibayama exhibition and the 1865 Kinkazan exhibition, were given special prominence by the creators of the Compendium of Events, in effect singling them out as the most important event of the year. Why should this be? The 1857 kaichō, held for 60 days beginning on the 16th day of the 4th month, was the only event listed for 1857. (Figure 17) The image shows the masses crossing the Ryōgoku bridge between the carnival grounds on the eastern side of the Sumida River (the make-shift booths can be seen in the foreground) and the sacred zone on the other side of the bridge. The main attractions of the kaichō were treasures from the Shibyama Nio-son Temple (in present-day Chiba prefecture, just east of Narita), included an 11 faced kannon statue attributed to Ennin, an early Heian period Buddhist monk famous for introducing esoteric rituals, sutras and relics into Japan from China, and the two Niō (or Kongōrikishi) muscular guardian deities who guard the entrance to the temple, reputed to have been brought to Japan from India. Amulets (fuda) promising protection against fires and theft issued by the temple bearing the image of the two Niō were popular among Edo commoners. Figure 18: Cleaning up after a Disaster. Source: Source: University of British Columbia. Library. Rare Books and Special Collections. QE537.2 J3 D57 1800z. “beans_disaster_prints_11.” (Click to enlarge, or visit source here). Although discouraged by kawaraban notices and posted signs, looting and price gouging and even acts of violence were not entirely absent in Japan in the wake of earthquakes and urban fires. In this anonymous print entitled “House Cleaning” (Kagu harai), a thief marvels at his luck to find an abandoned house full of goods free for the taking. With the memory of the 1855 earthquake, fire, and looting (see Figure 18) still fresh in people’s memory, the chance to be in the presence of these guardian deities (and buy special amulets) was not to be missed. According to the Bukō nenpyō, the Niō statues arrived at Ekōin in alcoves borne on the shoulders of sumo wrestlers. The misemono attractions on the other side of the Sumida, including contortionists and the famous doll maker, Takeda Genkichi, were no match. The illustration for the year 1865 also highlighted a kaichō held at the same Ekōin. (Figure 19) This religious extravaganza featured a collection of sacred objects from the island of Kinkazan, located off the eastern coast of northern Japan close to Ishinomaki (in present-day Miyagi prefecture). In the Edo period, it was a major pilgrimage destination and remains today as one of Japan’s so-called “power spots.” The 1865 display of its hidden treasures was especially popular. The image emphasizes the mass of humanity, crowed so tightly as to obscure any sense of individual identity. Temporary booths, the equivalent of circus tents, dominate the foreground while people make their way across the Ryokoku Bridge in the distance. Poles hold aloft rows of lanterns, banners proclaim the exhibition of treasures from far away Kinkazan, including the statue of Benzaiten, while others advertise an archery shooting gallery and the display of a giant elephant. Included in the exhibition was the main object of worship of Daikinji Temple, a carved wooden image of the eight-armed Benzaiten, reputed to possess extraordinary powers, especially with regard to healing and moneymaking. The Bukō nenpyō reports that men and women, young and old were lined up from early in the morning to gaze upon the goddess of good fortune and offer their prayers. People also joined in the wild dancing and jostled to obtain special amulets promising salvation, if not in this world, then in the next. The chants and dancing included many references to Miroku, alongside Benzaiten, one of the seven goods of good fortune. To be sure, the crowds making their way to Ekōin were in search of fun and games, but given the unsetting nature of the times, growing levels of impoverishment and desperation, and with no apparent avenue of escape, people were equally in search of salvation, healing, and renewal. Such millenarian aspirations also help to explain why contemporary chronologists placed such emphasis on the opportunities kaichō offered for engagement with powerful spiritual forces. Figure 19: 1865 (Keio 1 Itchū) Umi no kane (Gold in the Sea). Kaichō of Kinkazan Benzaiten held at Eikōin; many people gather from early in the day. Detail of Figure 1. (Click to enlarge). Aside from the five events listed in the Compendium of Events, as many as ten kaichō each year, many held simultaneously, attracted crowds of devotees. The Compendium of Events placed special importance on disasters as integral to the lived history of all Japanese during the bakumatsu years, listing episodes, one after another, of earthquakes, floods, fires, and epidemics. 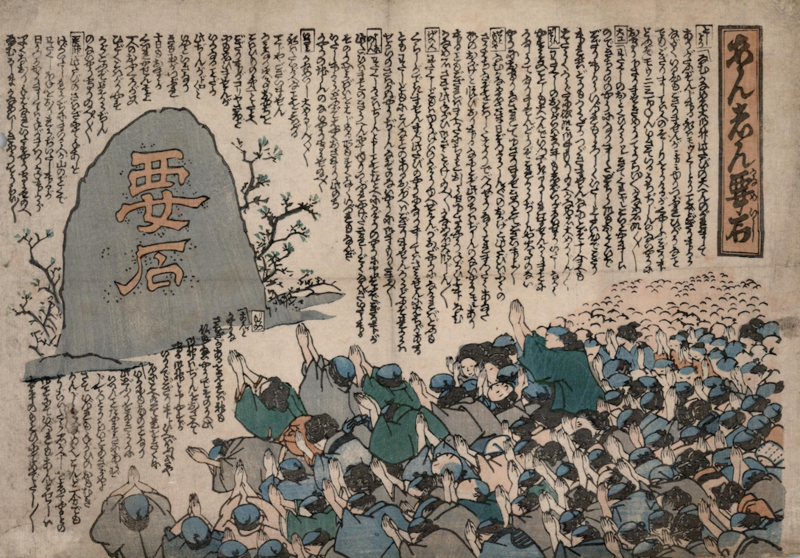 Challenging the conventional attention given political and military events, and to great heroes and villains, this print and other contemporary accounts (including the Bukō nenpyō, Genji yume monogatari, Fujiokaya nikki, and the Kaei Meiji nenkanroku) stood in awe of the power of nature. From the point of view of the commoners, especially those living in cities, disasters were major events that required record and memory. The carefree (ukiyo) image of the Eddoko must be augmented to include a constant awareness of natural disasters as repeating events, requiring practical preparation and the marshalling of spiritual protection. As noted in the introduction, of the 51 events listed between 1853 and 1866 in the Compendium of Events, at least 12 related to disasters, of which five were illustrated as the central event of that particular year. Even the dramatic arrival of American ships in 1853 demanding Japan open its doors to the world competed for attention with a large earthquake in the Odawara region on the 2nd day of the 2nd month. According to a contemporary account, “untoward events taking place in heaven and earth resulted in a clash of yin and yang forces producing thunder and rain in the skies and an earthquake in the ground.” The M6.7-7.0 quake did much to destroy Odawara Castle, the power base of the Ōkubo family: “The lord’s mansion suffered great damage. Nothing remained of the inner wall, the second wall, and the outer wall, which collapsed into the moat. Many pieces of the stone wall ended up in the water, and structures like the connecting watch towers were completely destroyed.” Alongside the foreign intrusion, the Odawara earthquake was seen as an opening volley in a series of assaults on the established order of heaven and earth. On the 27th day of the 11th month 1854, the era name Ka’e was changed to Ansei (peaceful rule), in the vain hope of restoring stability after the arrival of the ominous black ships and the death of Shogun Iesada – but more to the point, after a series of deadly natural disasters beginning with the Odawara earthquake. The Compendium of Events made no mention of the return visit of Perry on the 16th day of the 1st month of 1854, nor of the negotiations that led to signing, on the 3rd day of the 3rd month, of the Treaty of Kanagawa; instead the focus was on earthquakes and tsunami. Indeed, for commoners, Perry’s black ships were nothing compared with the power of nature. The Genji Yume Monogatari, written in 1864, described the series of disasters that struck Japan a decade earlier: “On the 13th day of the 6th month  there were a great earthquake along the line of the Tokaido and in the Northern provinces houses were overturned in places, and the high road opened and vomited mud and sand, causing the death of a large number of people. On the 15th day of the 7th month there was a great rain storm in the Northern provinces followed by a flood. The river Sae in Kaga, the rivers Koya, Tetori and Hine in Etchu overflowed their banks. The village of Asai was carried away and one hundred and fifty people drowned. On the 4th of the 11th month, between seven and nine o’clock in the morning, a violent earthquake shook the entire country, the effects of which were felt most severely at Osaka; damaging a large number of houses, and a huge wave ran up the three mouths of the Yodogawa, carrying large junks with it whose mast stuck the bridges and carried them away. One hundred and fifty junks of different size were destroyed. 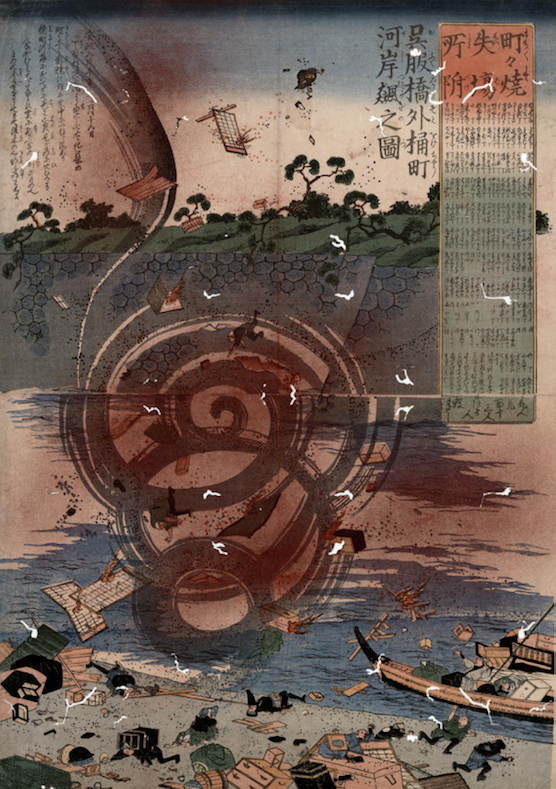 More people lost their lives by drowning than it was possible to ascertain.” This last event was listed and depicted in the Compendium of Events for 1854 “Title wave hits Osaka at the mouth of the Kizu River; houses swept away and bridges destroyed.” (Figure 20) One year after the tragedy, in 1855, recalling that a similar destructive tsunami had struck Osaka 148 years earlier (1707), local officials erected a stone monument to console the victims but also to serve as a warning for future generations. Figure 20: 1854 (Ansei 1 Kōin) Tani no mizu (Water in the valley). Tidal wave hits Osaka at the mouth of the Kizu river; houses swept away and bridges destroyed. Detail of Figure 1 (Click to enlarge). Figure 21: 1855 (Ansei 2 Itsubō) Tani no mizu (Water in the valley). Great earthquake strikes Edo on the 2nd day of the 10th month. Many people killed; several sections of the city, including Shin-Yoshiwara, destroyed by fire. Five rescue centers set up. The Marunouchi section particularly hit; many people suffer. Detail of Figure 1 (Click to enlarge). Causalities were estimated to be around eight to ten thousand, about 1 percent of Edo’s population. Over 14,000 houses were destroyed. People’s lives were literally shaken. Hundreds of earthquake-related broadsheets, especially so-called catfish prints (namazu-e), allow a glimpse into people’s thoughts and fears (for more, see essay by Greg Smits). Some sought to console the dead. (Figure 22) Others directed anger on the catfish, the symbolic perpetrator of earthquakes. (Figure 23) Others prayed for the restoration of peace and stability. (Figure 24) Others showed how, despite death and destruction, the earthquake seemed to benefit the working poor and weaken members of the political and economic elite. (Figure 25) In this sense, the earthquake became an instance of redistribution of wealth, indeed of world renewal (yonaoshi). As Smits argues, not only were the rich forced to regurgitate their profits, but the power of the Shogun was severely deflated. The quake exposed the Tokugawa rulers as incompetent, unable to deal effectively with Commodore Perry’s Black Ships in 1853 and 1854, and again helpless to resist the forces of nature. Disillusioned with the shogunate, people began to look elsewhere for political and spiritual leadership. While textbooks credit Perry as starting point for events that led to the Meiji Restoration of 1868, the Ansei Edo Earthquake can equally be seen as a catalyst accelerating socio-political changes. Figure 22: A Million Prayers for Earthquake Victims. Source: Hachiro Yuasa Memorial Museum, ICU, Poking Fun, p. 12 (Click to enlarge, or see full image here). 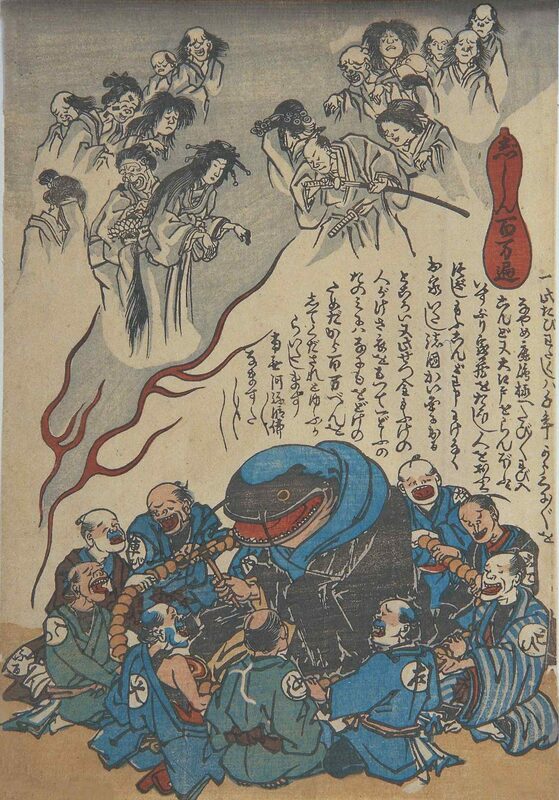 Catfish prints appeared in great numbers following the 1855 Edo Ansei Earthquake. Here the catfish, as a Buddhist monk, presides over a ceremony to chant the nenbutsu one million times as a means to appease the souls of the earthquake victims. Some of them, however, are not happy with their fate and glare angrily at the catfish. Figure 24: Praying to the Kaname-ishi for the Restoration of Stability. Source: University of British Columbia. Library. Rare Books and Special Collections. QE537.2 J3 D57 1800z. “beans_disaster_prints_14” (Click to enlarge, or visit source here). According to catfish lore, earthquakes occur when a giant catfish, pinned down by a foundation stone (kamae-ishi) in turn held in place by the Kashima deity, somehow breaks free and trashes about. Either the Kashima deity is away or asleep, or the foundation stone itself is at fault. Here people, represented by the elderly, young women, china shop owners, carpenters, entertainers, prostitutes, physicians and others, offer prayers to the foundation stone, seeking a return to everyday peace and stability. They want an end to the recent spate of earthquakes. The old man has had enough; he wants to live another 200 or even 300 years and never again experience an earthquake! The carpenter is overworked and wants a chance to have a rest. The doctor is also overworked and wants his many patients to recover. In general, everyone wants a return to the ordinary rhythms of life. And when a “reasonable person” (rikutsumono) speaks up, expressing doubts about the foundation stone’s divine powers, the stone itself replies: “I assure you that if the earth moves even a little I will stand on my head” (or, if read differently, “I will take revenge”). Figure 23: A giant catfish being punished for causing earthquakes. Source: University of British Columbia. Library. Rare Books and Special Collections. QE537.2 J3 D57 1800z. “beans_disaster_prints_15” (Click to enlarge, or visit source here). Wealthy merchants, geisha, and priests are among those who seek to punish the catfish. There were those, however, who sought restraint, including construction workers, plasterers, roof tile sellers and other who gained unexpected profits from the disaster. Figure 25: Redistribution of Wealth. Source: University of British Columbia. Library. Rare Books and Special Collections. QE537.2 J3 D57 1800z. “beans_disaster_prints_30” (Click to enlarge, or visit source here). As reflected in numerous catfish prints, the destruction of the buildings and storehouses of the rich and powerful allowed for a certain re-distribution of wealth. Carpenters, roofers, plasters, and groups of day-workers reaped profits repairing the residences of the wealthy. Moreover, the disaster imposed a serious financial strain on the bakufu already burdened with the cost of building military fortifications. Here the Kashima deity has resumed control over the giant catfish and the rich are showering members or the working class with gold coins. In this reading, the catfish is not a symbol of destruction, but of social rectification (yonaoshi). Figure 26: 1856 (Ansei 3 Heishin) Isogo no kane (Gold on the beach). Great storm hits the Fukagawa area [in Edo] on the 25th day of the 8th month; large floods wash many houses away. Detail of Figure 1 (Click to enlarge). 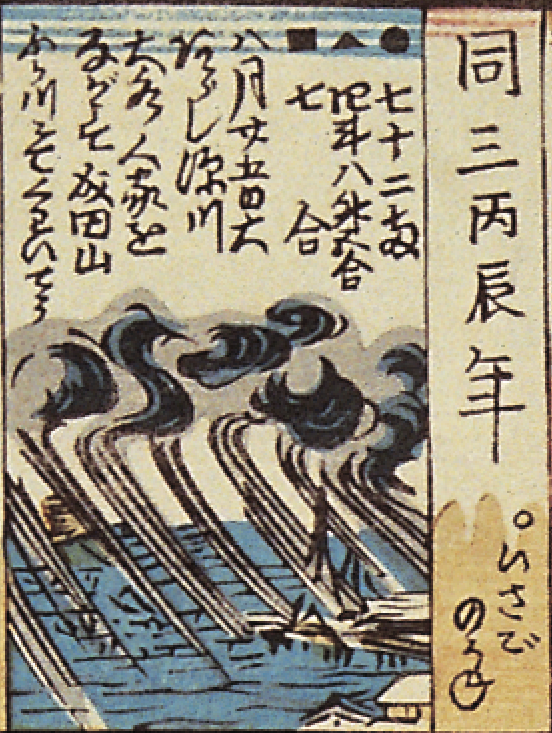 Figure 27: Kawaraban news of typhoon, flood and fire to strike Edo in 1856. Source: University of British Columbia. Library. Rare Books and Special Collections. QE537.2 J3 D57 1800z. “beans_disaster_prints_10” (Click to enlarge, or view source here). For text, visit here. 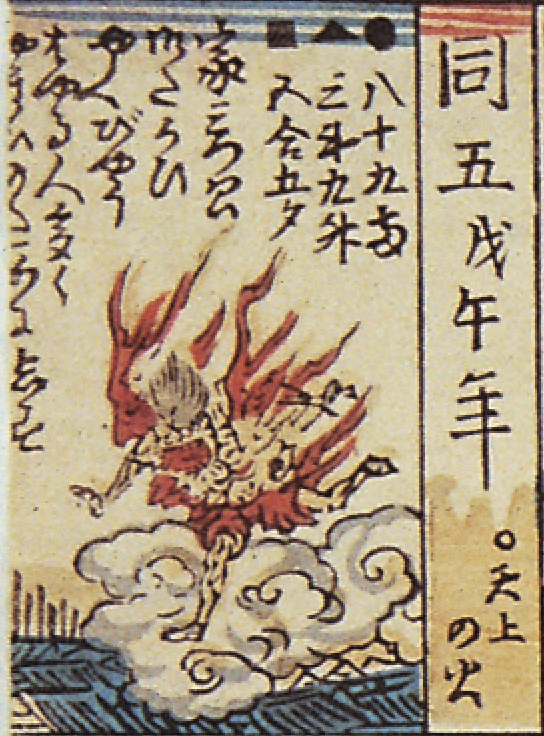 Figure 28: 1858 (Ansei 5 Bōgō) Tenjō no hi (Fire from Heaven). Detail of Figure 1. [Cholera] epidemic spreads widely; many people die of the sickness (Click to enlarge). The image shows a fiery demon descending upon the city. Such evil spirits (akushin) had long been associated with the arrival of other deadly scourges, such as smallpox and measles. Rumors had it that cholera was introduced into Japan by American ships calling at Nagasaki. In the 6th month it quickly spread to Kyoto and then along the Tokaidō, reaching Edo in the 7th month, just after Tokugawa officials had signed the Treaty of Amity and Commerce aboard an American warship anchored in Edo Bay. The epidemic was at its worse in the 8th month and gradually receded in the 9th month. According to the Genji Yume Monogatari, “A terrible pestilence broke out. … Its symptoms were a sudden attack of fever, violent vomiting and constant motions; the whole body became cold, and the patient, worn out with pain, died in a couple of days. In several cases the patient succumbed in thirty-six hours, so that by the common people it was called ‘three-day cholera.’” This source estimated the national death toll at 300,000. This may be an exaggeration; in Edo the estimates were between 20,000 and 30,000 dead for a mortality rate between 2 and 4 percent. Among the dead were the great ukiyo-e artist Hiroshige, and more ominously, the 35-year-old shogun, Tokugawa Iesada. The sight of dead bodies on the streets of the city became common. With so many people dying each day, cremation centers were busy beyond capacity. Coffins piled up like a mountain and bodies went unattended for days. Edo commoners were suddenly witness to a seemingly unending succession of funeral processions; in the Kanda area, for example, fifty or sixty processions could be seen daily, and well over one hundred crossed over the great Nihonbashi. People resorted to various remedies, but nothing seemed to work. It is no wonder that a contemporary compilation of broadsheets and leaflets circulating at the time of the calamity was entitled Matsudai banashi hakiyose zōshi—Swept Up Stories of the Latter Days. Figure 29: Ansei 5 16th day of 11th month. Source: University of British Columbia. Library. Rare Books and Special Collections. QE537.2 J3 D57 1800z. “beans_disaster_prints_2” (Click to enlarge, or view source here). No sooner had the comet disappeared from sight than another disaster struck Edo—this time trial by fire. According to the Bukō nenpyō, a fire broke out in the Asakusa are on the morning of the 12th day of the 11th month, 1858. Hot dry winds sent embers far and wide and fires were reported as far as the Azabujuban area. On the 15th another fire broke out in Kanda. Fanned by strong northwesterly winds it quickly spread to samurai residential areas and reached the area around Bakurocho, near Nihonbashi. The fire flared up again in the morning, this time provoked by powerful northeaster winds, and, jumping over the Yanagihara embankment, succeeded in burning the entire Kanda district and a broad area east as far as the Sumida river. Then, just as people thought the fire was dying down, suddenly what appeared to be a fire whirl, caused by intense rising heat and turbulent wind conditions, descended on the Gofukubashi area close to the Sotobori embankment, uprooting trees and tragically killing a number of people who had managed to escape the blaze along with some of their household goods. (Figure 29) Neither of these events, the comet or the fire whirl, were included in the Compendium of Events for 1858, but they certainly confirmed the horoscope for the year: fire from heaven. The same forecast proved true for 1859. The central image in the Compendium of Events for the year featured the main keep of Edo Castle engulfed in red flames. 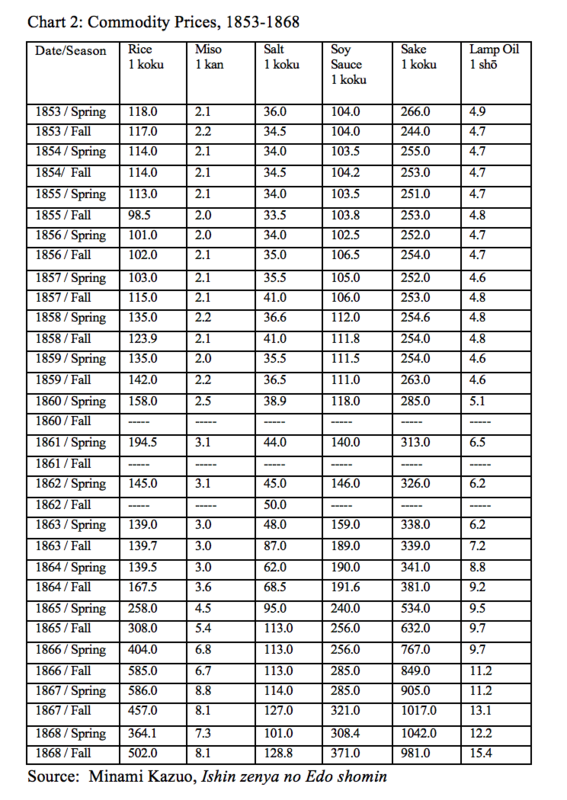 (Figure 30). The fire that broke out on the 17th day of the 10th month could easily be viewed as criticism of the ruling elite, powerless to fend off the foreigners, and equally discredited for its failure to prevent or at least ameliorate the effects of earthquakes and epidemics—and fires. The Genji Yume Monogatari, for example, began its coverage of 1859 with a reference to the Ansei purges and “the violent and arbitrary way in which Ii Kamon no Kami (Ii Naosuke) governed,” hinting that such indignation and hatred could easily lead to revolt against the “onerous government” of the bakufu. 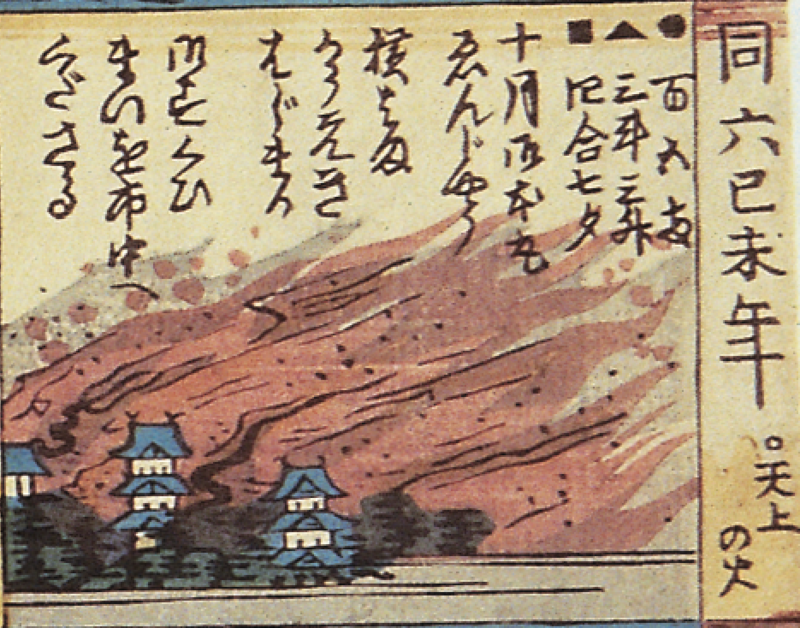 This was immediately followed by a description the fire that “consumed the Shogun’s residence, with all the adjoining buildings, while the flames spreading to towers of the enceinte burnt them down also.” The Bukō nenpyō added that all of the buildings of the Ōoku, the woman’s quarters of the shogunal palace, were, without exception, destroyed by the fire. According to the Bukō nenpyō, Edo was hit by some 14 major fires during 1859; in addition to the Edo Castle fire, the Aoyama fire that began on the 21st day of the 2nd month destroyed more than 20 daimyo residences and more than 50 temples along an 8 km stretch between Aoyama and Zoshigaya. Right from the beginning of the year, “fire from heaven” seemed to take aim at the ruling elite, presaging the assassination of Ii Naosuke in 1860. Figure 30: 1859 (Ansei 6 Kibi) Tenjō no hi (Fire from Heaven). In the 10th month, the main keep of Edo Castle goes up in flames. Detail of Figure 1 (Click to enlarge). Figure 31: 1862 (Bunkyū 2 Jinjutsu) O-umi no mizu (Water in the Ocean). Largescale outbreak of Measles in Edo and throughout Japan; number of deaths unknown. Detail of Figure 1 (Click to enlarge). Political and economic disasters dominated the 1860s, but natural calamities continued to exacerbate a shared sense of distress and vulnerability. The Compendium of Events made no mention of the so-called Namamugi Incident that took place on the 21st day of the 8th month, 1862. The murder of Charles Richardson by Satsuma samurai came to symbolize new levels of violence between supporters and enemies of the Tokugawa regime. Instead the “cover story” for 1862 was the outbreak of a measles epidemic. (Figure 31) There were incidents of measles in 1859, 1860, and 1861, but in the summer of 1862, the disease spread throughout the country, affecting 63 percent of the population (including Shogun Iemochi): it was the most devastating epidemic of measles in Japanese history. According to the Bukō nenpyō, like cholera, measles (hashika) was introduced into Japan from overseas in the 2nd month, spreading to Osaka and Kyoto by the 4th month, before reaching Edo in the 7th month. There was no household that escaped the disease. In Edo, the death toll stood at 20,952 persons. According to Minami Kazuo, the measles epidemic produced far more victims than the 1858 bout with cholera; by rough count, whereas in 1858 some 100 funeral processions passed over Nihonbashi in one day, in 1862 the peak was over 200 processions. Naturally, the psychological impact of such rapid loss of life was great. As with the catfish prints that followed the Ansei Edo earthquake of 1855, measles prints (hashika-e) offer glimpse into how ordinary people imagined, interpreted and dealt with what seemed to be ever-unfolding episodes of disaster. Figure 32: Hashika-e Stories of Measles Victims. Source: Hachiro Yuasa Memorial Museum, ICU, Poking Fun, p. 13 (Click to enlarge, or see full image here). A deadly measles epidemic hit Japan in 1862. Measles prints offered practical advice (foods to avoid and foods with curative powers) and sometimes served as a charm to keep the disease out of the home. The epidemic caused severe economic dislocations within Edo. In this print, teahouse operators, geisha, and other works who suffered loss of income express their anger at a measles victim, while doctors and medicine sellers offer some protection. The popular saying, “Fires and fistfights are the flowers of Edo,” captures the ubiquity of fires and firefighting in Edo. The “three great fires” (Meireki fire in 1647; Meiwa fire in 1772, Bunka fire in 1806) were particularly destructive, but more than 1,800 fires, large and small, struck the city and its wooden buildings during the 267 years of the Tokugawa period. Fire disaster in the bakumatsu years was particularly onerous; the Bukō nenpyō and other contemporary sources reference more than 500 fire episodes during the15 years between 1853 and 1868. The Compendium of Events lists several of these conflagrations. In 1866, for example, reference is made to large fires that broke out in Edo on the 9th day and 10th day of the 12th month. The Bukō nenpyō in fact lists some 19 fires for the year, adding to the sense of crisis that gripped the people of Edo already confronted with rising commodity prices, urban rioting, poor camps, street theft and robbery, the shogun’s death, and unusual weather in the form of typhoons, extreme thunder storms, and floods in the summer followed by an autumn dry spell. According to the Bukō nenpyō there was no rain for fifty days between the 12th day of the 10th month and the 2nd day of the 12th month, creating ideal fire conditions. A fire broke out on the 3rd day of the 11th month in the Samegabashi area close to Yotsuya consuming parts of the Kii daimyo residence. On the 4th day, a major fire struck the Fukugawa district causing extensive damage. On the 6th came another fire, this time in Shiba. Then on the 9th day, a major fire, fanned by strong dry winds, burned for two days and spread widely in the area in around Kanda, Yaesu, and Hibiya and other “low city” districts, destroying daimyo residences, temples, shrines, and over 100 storefronts. This disaster was followed immediately by another fire that struck the already depressed Yoshiwara pleasure district, destroying nearly all of the teahouses in the area. The next year,1867, also saw Edo burning. On the 29th day of the 12th month, 1866, two major fires extinguished any hope for recovery of a sense of physical and psychological stability. One fire attacked the Hongo area, destroying samurai barracks and threatening several daimyo residences; the other struck temples and samurai residences in the Koishikawa area. As a result of the frequent fires, official New Year’s ceremonies were cancelled, and the streets were strangely quiet. The fires, however, kept coming, the first one destroying the residence of the daimyo of Okayama located in the Marunouchi area close to Edo Castle. The Buyō nenpyō made note of some 15 fires for 1867, 10 of them in the spring. Of these, the Compendium of Events singled out a fire at the end of the year, just before the outbreak of the Boshin Civil War: “Fire breaks out in Akabane (in Edo) on the 25th day of the 12th month; it burns as far as Shinagawa; many people die.” It fact this was a reference to an attack on the Satsuma residence in Shiba led by the daimyo of Shōnai domain, charged with police duties in Edo. Rumor had it that Satsuma samurai had set fire to Nishinomaru Palace two days earlier, on the 23rd day of the 12th month, with the intention to liberate Kazunomiya (widow Shogun Iemochi and half-sister of former Emperor Kōmei) and Atsuhime (widow of Shogun Iesada and adopted daughter of Shimazu Nariakira, the former daimyo of Satsuma). The Satsuma residence was burnt to the ground. When news of these fires reached Shogun Yoshinobu in Osaka, the decision was made to march on Kyoto and engage troops that had begun to call themselves the Imperial Army. The final disaster story takes place in 1868: “Massive flooding in Osaka, many bridges washed away.” Even in the midst of a bloody civil war, people nonetheless had to deal with forces often more powerful than rifles and cannon. 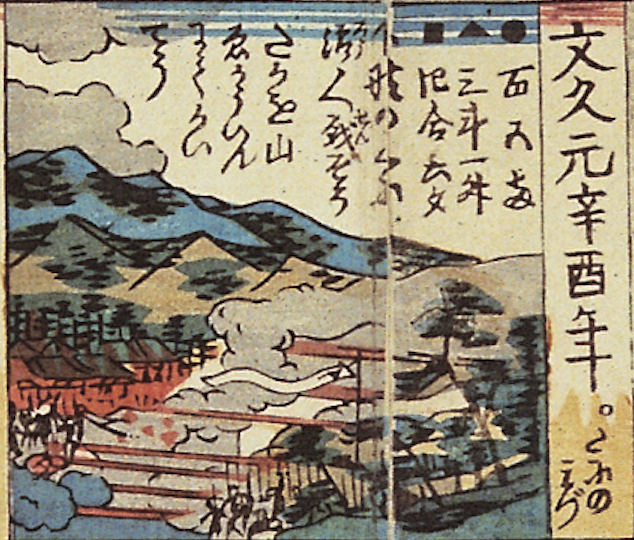 The Osaka flooding took place in the fifth month, around the same time as the attack on the Shōgitai, the so-called Battle of Ueno Hill, the event depicted in the last frame of the chronology. The great city of Osaka, occupied by imperial forces after street fighting and the torching its great castle, was doubly a disaster victim. Beginning on the 8th day of the 5th month and peaking on the 19th day, the Yodo River breached its embankments and inundated the city. Much like the citizens of Edo forced to witness the defeat of upholders of the old regime, the people of Osaka could only gaze in terror as the infrastructure of their great city was equally destroyed by flame and flood. What is history? Who makes it? What are its sources? Who decides which events are worthy of memory? These are the sorts of questions that plague historians. In the case of Japanese history, as in other histories, political events, including the reigns of shoguns and emperors, are often used to indicate major breaks with the past or new beginnings. The Meiji Restoration of 1868, the birth of modern Japan, is thus the end of the Tokugawa political system (baku-han taisei) and the advent of more centralized imperial system (tennō-sei). But there are other approaches to the story of modern Japan. 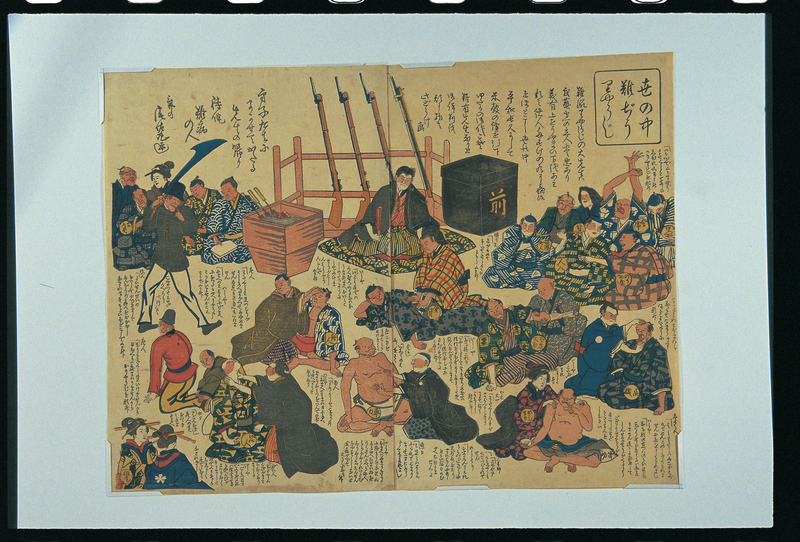 The Compendium of Events, a woodblock print issued in the middle of 1868, allows for a more contemporaneous or lived view of changes underfoot during the late Tokugawa years. Alongside political and economic forces, this visual source gives special insight into the role played by religious forces (including both prayer and play) and natural forces, particularly natural disasters, in historical change. Earthquakes, epidemics, floods and fires helped to discredit the old regime by the sheer cost of human cost of death and suffering, and the economic cost of recovery and rebuilding, but equally by the psychological cost of popular disillusionment, disenchantment and distrust of a government that had proved itself unable to prevent these untoward events from happening and failed to come to the rescue of the people. This happy outcome, however, was not inevitable. As visual sources, such as the Compendium of Events, helps to make clear, the experience of ordinary people during the turbulent years between 1853 and 1868 was hardly happy: some made money but many more found their means of livelihood in danger, some found faith in millenarian dreams, but many more feared that all roads ahead were blocked. And as governments faltered and failed to provide everyday peace and stability, many were forced to fend for themselves. Finally, as if the reality of foreign threats and domestic unrest was not enough, people, rich and poor, were challenged by a seemingly interminable series of natural disasters. The Compendium of Events thus becomes a valuable visual record of the extraordinary resilience of ordinary people confronted by a nightmare of apocalyptic proportions. The copy of “A Compendium of Events and Record of the Rice Market from 1853 to 1868” (Ka’ei nenkan yori bei sōba nedan narabi ni nendaiki kakinuki daishinpan) translated and analyzed here is from the Japanese print collection of the Yuasa Hachirō Memorial Museum (International Christian University). 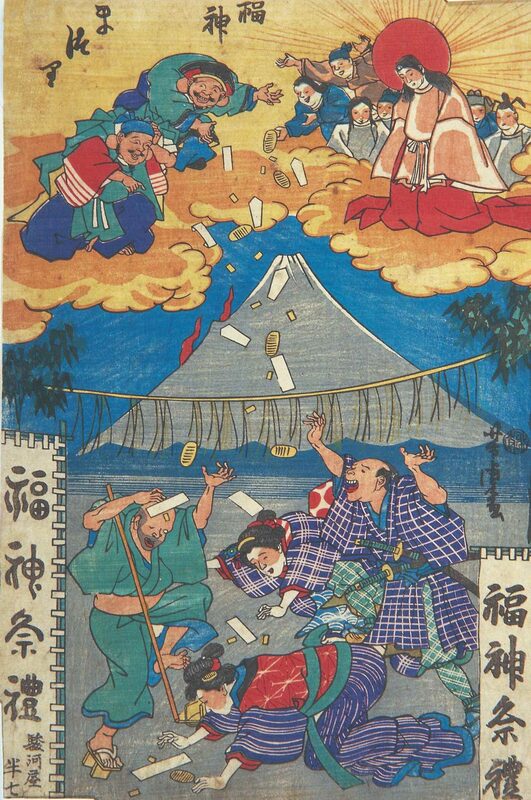 It and other bakumatsu prints are included in: Poking Fun at the Restoration: Satirical Prints in Late 19th Century Japan, edited and published by ICU Hachirō Yuasa Memorial Museum, 2012. Other copies of the Compendium of Events include: Boston Museum of Fine Arts; and the University Library, University of Tokyo (Ishimoto Collection of Earthquake and Disaster Prints, no. 230). Osatake Takeshi made brief mention of the print in Meiji bunka zenshū, vol. 21 (Shakai-hen), Tokyo: Nihon Hyoronsha, 1929, pp. 40-41. The print was reproduced inside the front cover. Osatake noted that it was an early example linking changes in the market (the price of rice) with social and political change. See also note in Meiji bunka kenkyū, Third year, vol. 3 (section 4), April 1927. Unless otherwise noted, dates follow the solar-lunar calendar in use in Japan before the switch to the Western calendar in 1873, given in the order of day, month, and year. For a convenient overview of the bakumatsu years, see the introduction (“Domestic Disorder, Imperialism, and National Consolidation”) in Anne Walthall and M. William Steele, Politics and Society in Japan’s Meiji Restoration, A Brief History with Documents, (Boston and New York: Bedford/St. Martin’s, 2017), pp. 1-27. On the use of images as historical evidence, see Peter Burke, Eyewitnessing: The Uses of Images as Historical Evidence, Ithaca: Cornell University Press, 2001. Regarding visual narratives, Burke notes that “one of the most important consequences of printing images was to make it possible to produce pictures of current events and to sell them while the memory of those events was still fresh” (p. 141). In addition to the collection of the Yuasa Hachirō Memorial Museum, the essay takes advantage of the University of British Columbia’s “Meiji at 150 Digital Resources” website. 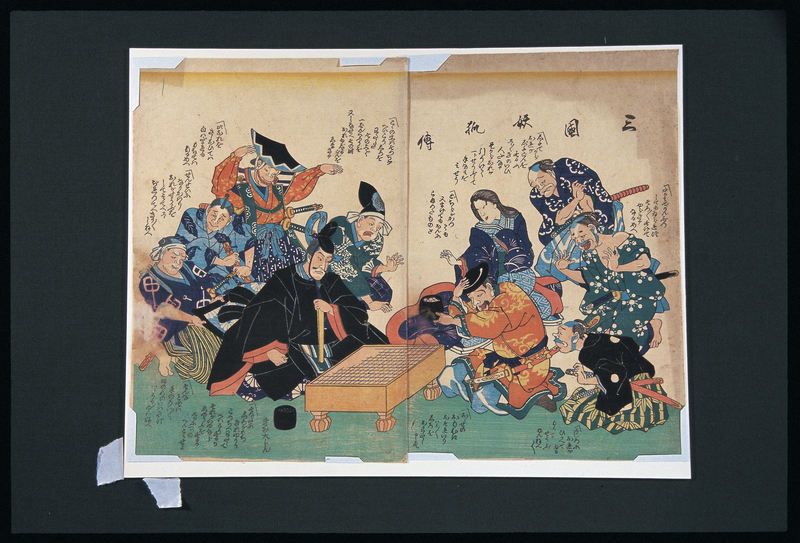 For description and examples of sugoroku board games, see Rebecca Salter, Japanese Popular Prints: From Votive Slips to Playing Cards, Honolulu: University of Hawai’i Press, 2006, pp. 164-182. See also the essay by Kanaya Masatake in the UBC’s “Meiji at 150 Visual Essays” series: “Reading Edo Urban Space in the Tōkyō Gōshō Sugoroku (Tokyo Rich Merchant’s Board Game)“. On chronologies and graphic representations of times, see Daniel Rosenberg and Anthony Grafton, Cartographies of Time: A History of the Timeline, Princeton: Princeton Architectural Press, 2012. Rosenberg and Grafton, quoting Hayden White, p. 12. Michael P. Onorato, “The Opening of Japan, 1849-1854: America ‘Finds the Key,” Asian Studies, 6:3 (1968), pp. 286-296. For a basic information on kawaraban, see Sepp Linhart, “Kawaraban—Enjoying the News when News was Forbidden,” in Susanne Formanek and Sepp Linhart, eds., Written Texts – Visual Texts: Woodblock-printed Media in Early Modern Japan, Amsterdam: Hotei Publishing, 2005, pp. 231-250. For details on kawaraban and the impact of the “black ships” in 1853 and 1854, see “Goemon’s New World View,” in M. William Steele. Alternative Narratives in Modern Japanese History, London: Routledge, 2003, pp. 4-18. See also John Dower’s visual essay, “Black Ships & Samurai: Commodore Perry and the Opening of Japan (1853-1854),” in the MIT Visualizing Cultures site. 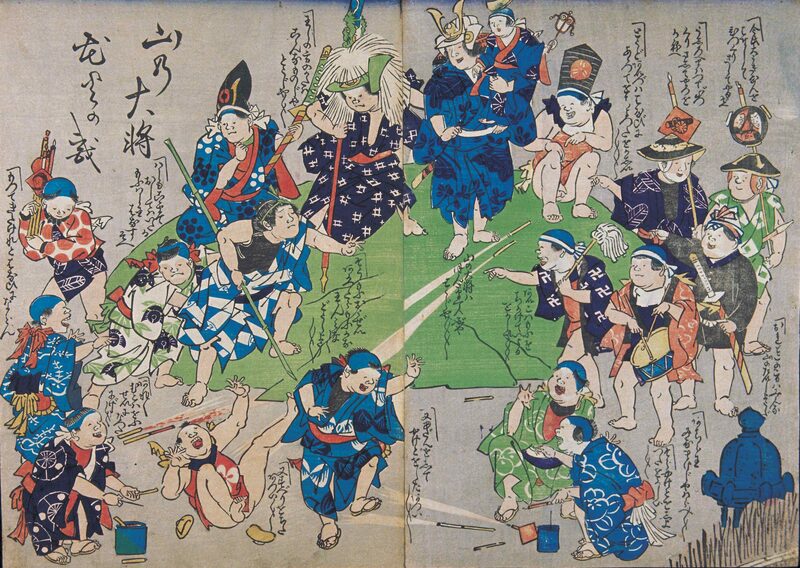 See also, “Perry in Japan, a visual history,” Brown University Library Center for Digital Scholarship. Finally for digital versions of late Tokugawa kawaraban, see the Ono Hideo Collection maintained by the University of Tokyo. This collection includes a broad selection of images related to political and international affairs, but also to fires, earthquakes, and floods and other events related to social and cultural history. For images connected with the opening of Japan to foreign trade, see John Dower’s “Yokohama Boomtown: Foreigners in Treaty Port Japan” unit in the MIT Visualizing Culture website. The incident was reported in many contemporary accounts, including the Kinsei Shiraku (translated into English in 1873 as Kinsé shiriaku): “During the 1st month of the 1st year of Bunkyū the number of the rónins in Hitachi and Shimôsa increased to such an extent that they proceeded into Kôdzuké and Shimotsuké, where, under pretext of requiring war contributions for the expulsion of the barbarians, they extorted money from the peasants and tradespeople. The Bakufu ordered the house of Mito to arrest them.” Kinsé Shiriaku: A History of Japan from the First visit of Commodore Perry in 1853 to the Capture of Hakodate by the Mikado’s Forces in 1869, E. M. Satow, trans., Yokohama: Japan Mail Office, 1873, p. 17. The Kaei Meiji Nenkan Roku also includes details of the incident at Sawara, and of later disturbances caused by the Mito ronin. Ge volume, pp. 736, 742, 745, 747 (reproducing the Mino ronin manifesto), 767, 770, 773, 778, and 783 (on the ronin attack on the British Legation). Baba Bun’ei, Japan, 1853-1864, or Genji Yume Monogatari, trans. Ernest Mason Satow (Tokyo: Naigai Shuppan Kyōkai, 1905) as excerpted in Walthall and Steele, Politics and Society in Japan’s Meiji Restoration, pp. 101-103. The entire text in translation is archived online here. The reactions of urban commoners to the breakdown in public order as described in graffiti, popular songs, and irreverent verse are included in Motoyama Yukihiko, “Patterns of Thought and Action of the Common People during the Bakumatsu and Restoration Epoch,” in Proliferating Talent: Essays on Politics, Thought and Edcation in the Meiji Era, (J.S.A. Elisonas and Richard Rubinger, eds.,) Honolulu: Hawai’i University Press, 1997, pp. 63-81. See also Minami Kazuo, Ishin zenya no Edo shomin, Tokyo: Kyōikusha, 1980. According to Daniel Botsman, a total of 123 severed heads were put on display in Edo between 1862 and 1865. See Daniel Botsman, Punishment and Power in the Making of Modern Japan, Princeton: Princeton University Press, 2013, p. 20. Minami Kazuo, Ishin zenya no Edo shōmin, Tokyo: Kyōikusha, 1980, p. pp. 155-57. On the ee ja nai ka movement, see George Wilson, Patriots and Redeemers in Japan: Motives in the Meiji Restoration, Chicago: University of Chicago Press, 1992. See page 106 for a version of this chant. On visual representations of the ee ja nai ka craze, see “Publishing Ējanaika: Popular Religion as Media Event,” in Formanck and Linhard, eds., Written Texts – Visual Texts, pp. 311-340. See also Walthall and Steele, pp.122-126, for documents on the ee ja nai ka movement. On the experience of Edo commoners during this fateful year, see “Edo in 1868,”in M. William Steele, Alternative Narratives in Modern Japanese History, London: Routledge, 2003, pp. 61-87. Henry Smith II, “The Edo-Tokyo Transition: In Search of Common Ground,” in Marius Jansen and Gilbert Rozman, eds., Japan in Transition: From tokugawa to Meiji, Princeton: Princeton University Press, 1986, p. 347. Katsu Kaishū zenshū, Tokyo: Keisō shobō, 1973, vol. 19, p. 25. Dispatch from Harry S. Parks to the Foreign Office, Yokohama, June 13, 1863, no. 139 (F.O. 46/94). Quoted in Steele, “Edo in 1868,” p. 72. On the Shōgitai and the Battle of Ueno Hill, see M. William Steele, “The Rise and Fall of the Shōgitai: A Social Drama,” in Tetsuo Najita and J. Victor Koschmann, eds., Conflict in Modern Japanese History, Princeton: Princeton University Press, 1982, pp. 128-144. For kawaraban reportage on the fire in northeastern Edo that resulted from the battle between the imperial army and the Shōgitai, see the University of Tokyo Ono Hideo Collection. Soyofuku Kaze, no. 7, n.d., in Bakumatsu Meiji Shinbun Zenshu, 3, p. 408. On late Tokugawa monetary policy, see Takehiko Ohkura and Hiroshi Shimbo, “The Tokugawa Monetary Policy in the Eighteenth and Nineteenth Centuries,” in Michael Smika, ed., The Japanese Economy in the Tokugawa Era, 1600-1868, London: Routledge, 2012, pp. 241-64. Wilson, Patriots and Redeemers, p. 82. On Japanese folk religion, see Hori Ichiro, Folk Religion in Japan, Chicago: University of Chicago Press, 1994 (reprint). For description of kōshin worship and other local cults, see pp. 66-68. Helen Hardacre, “Conflict between Shugendō and the New Religions of Bakumatsu Japan,” Japanese Journal of Religious Studies, vol. 21, No. 2/3 (1994), pp. 137-166. See the website created by the National Diet Library of Japan on publications relating to the history of climbing Mt. Fuji. It includes reference to a popular book published by Kanagaki Rōbun in 1860/1861 on climbing Mt. Fuji in 1860: Kokkei Fuji mōde. This book includes an illustration of both men and women climbing Mt. Fuji. On early modern rural uprisings, see Stephen Vlastos, Peasant Protests and Uprisings in Tokugawa Japan, Berkeley: University of California Press, 1990, and Herbert Bix, Peasant Protest in Japan, 1690-1884, New Haven: Yale University Press, 1986. On rural unrest in 1866, see Patricia Sippel, “Poplular Protest in Early Modern Japan: The Bushū Outburst,” in Harvard Journal of Asiatic Studies, 37.2, 1977, 273-322. On urban unrest, see Anne Walthall, “Edo Riots,” in James McClain and John Merriman, and Ugawa Kaoru, eds., Edo and Paris: Urban Life and the State in the Early Modern Era, Ithaca: Cornell University Press, 1994, 407-428. See also Minami Kazuo, Ishin zenya no Edo shōmin, Tokyo: Kyōikusha, 1980, especially chapter 3, pp. 139-194. Walthall and Steele, “Outbursts of Popular Discontent,” pp. 110-113. On kaichō, see Barbara Ambros, “The Display of Hidden treasures: Zenkōji’s Kaichō at Ekōin in Edo,” Asian Cultural Studies, 30, 2004, 1-26. See also Nam-lin Hur, Prayer and Play in Late Tokugawa Japan, Cambridge: Harvard University Press, 2000 (See especially the Conclusion: “The Cradle of Prayer and Play” for a description and the significance of kaichō) and Nishiyama Matsunosuke, Edo Culture: Daily Life and Diversions in Urban Japan, 1600-1868, Honolulu: University of Hawai’i Press, 1997. In Japanese, see Hiruma Hisashi, Edo no kaichō, Tokyo: Yoshikawa Kōbunkan, 1980. On misemono, see Andrew Markus, “The Carnival of Edo: Misemono Spectacles from Contemporary Accounts,” Harvard Journal of Asiatic Studies vol. 45, no.2 (Dec. 1985), pp. 499-541. 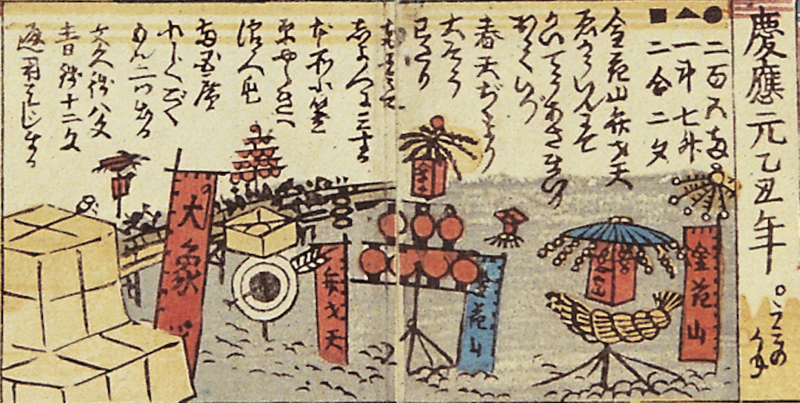 The Bukō nenpyō, a contemporary record of memorable events, complied by Saitō Gesshin (1804-1878) pays particular attention to kaichō. It includes details on each of the kaichō noted in the Compendium of Events, noting items on display for religious veneration in the temple as well as events and display relating to popular entertainment in nearby carnival space. The bakumatsu years are covered in: Imai Kingo, ed., Teihon Bukō nenpyō, vol. 3 (ge), Tokyo: Chikuma Gakugei Bunko, 2004. Markus provides a contemporary description of the misemono shows that accompanied kaichō at Ekōin around 1865, p. 509. Bukō nenpyō, vol. 3 (ge), p. 93. On Miroku, and connections with millenarian aspirations in the Edo period, see Miyata Noboru, Miroku shinkō no kenkyū (Tokyo: Miraisha, 1970), and his later work on apocalyptic beliefs in Japanese folklore, Shūmatsu-ron no minzokugaku (Tokyo: Kōbundō, 1987). Nam-lin Hur, Prayer and Play, p. 220. Ambros, “Display of Hidden Treasures,” p. 4. On the genre of “disaster descriptions” during the Edo period in general, and in the bakumatsu period in detail, see Stephan Köhn, “Between Fiction and Non-fiction – Documentary Literature in the Late Edo Period,” in Formanek and Linhart, eds., Written Texts – Visual Texts, pp. 283-310. From the text on a 1853 kawaraban broadsheet reporting news of the Odawara earthquake. The text and broadsheet is included in Kinoshita Naoyuki and Yoshimi Shunya, eds., Nyūsu no tanjō, Tokyo: Tokyo Daigaku Shuppankai, 1999, p. 31. For online reproduction of the 1853 kawaraban: Large flooding in Osaka, many bridges washed away. For a short discussion of the yin yang theory of earthquakes, see Gregory Smits, Seismic Japan: The Long History and Continuing Legacy of the Ansei Edo Earthquake, Honolulu: University of Hawai’i Press, 2013, pp. 31-34. Genji Yume Monogatari, pp. 10-11. For archived online version, see here. Smits describes these earthquake and tsunami events, “Warding off Calamity,” pp. 14-15. For a description of this tsunami warning stone, see Nagao Takeshi, “‘Dai jishin ryōkawa-guchi tsunami ki’ ni miru Osaka no tsunami to sono kyōkun,” Kyoto rekishi saigai kenkyū, no. 13 (2012), pp. 17-26, available online here. For text of tsunami stone in modern Japanese, see here. For kawaraban image of the Osaka tsunami, see Taiyō korekushon: kawaraban shinbun, vol. 1, Tokyo: Heibonsha, 1978, pp. 26-27. Genji Yume Monogatari, pp. 10-11. For archived online version, see here. Genji Yume Monogatari, p. 11. 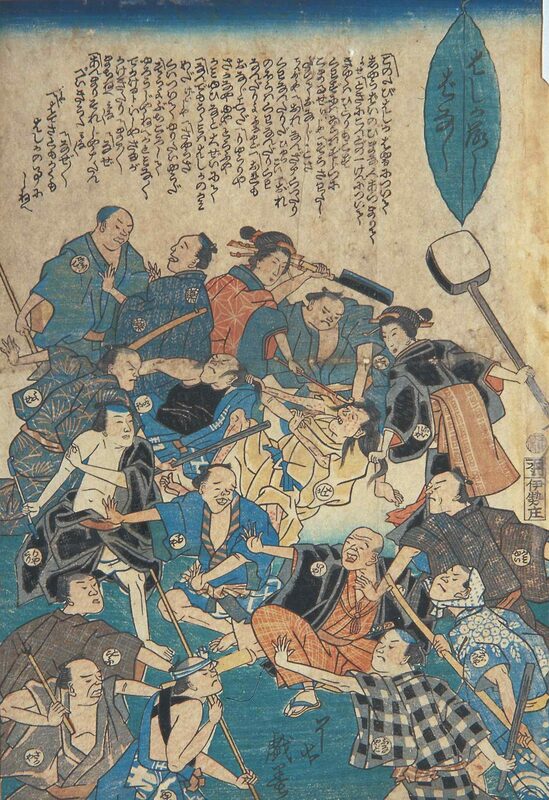 See also the richly illustrated Ansei kenbun shi, available online through the Waseda University Library Collection of Japanese and Chinese Classics here. On the revolutionary (or not) nature of the 1855 earthquake, see Smits, Seismic Japan, Chapter 5 “Meanings,” pp. 139-170. Bukō nenpyō, vol. 3 (ge), p. 85. Kanagaki Rōbun, Ansei Fūbun shi [Collection of Hearsay on the Ansei Period Storm], 3 vols., 1856. Available online through the Waseda University Library Collection of Japanese and Chinese Classics here. Bukō nenpyō, vol. 3 (ge), pp. 13-14. For kawaraban coverage of the 1858 cholera and 1862 measles epidemics, see Yoshida Yutaka, Edo no masukomi “kawaraban,” Tokyo: Kōbunsha, 2003, pp. 179-237. A measles print shows people throwing beans at a measles demon (looking remarkably similar to the cholera demon in figure 28) in order to drive it away (pp. 232-33). For details on the cholera epidemic with a focus on popular understandings of the disease, see Bettina Gramlich-Oka, “The Body Economic: Japan’s Cholera Epidemic of 1858 in Popular Discourse,” East Asian Science, technology, and Medicine, no. 30, Special Issue: Society and Illness in Early Modern Japan (continued), 2009, pp. 32-73. See also Ann Bowman Jannetta, Epidemics and Mortality in Early Modern Japan, Princeton: Princeton University Press, 2014, pp. 164-69. The Bukō nenpyō, vol. 3 (ge), reported in on the course of the epidemic, noting that cholera had first entered Japan in 1819 (actually 1822). See pages 103-06. Bukō nenpyō, vol. 3 (ge), p. 27. 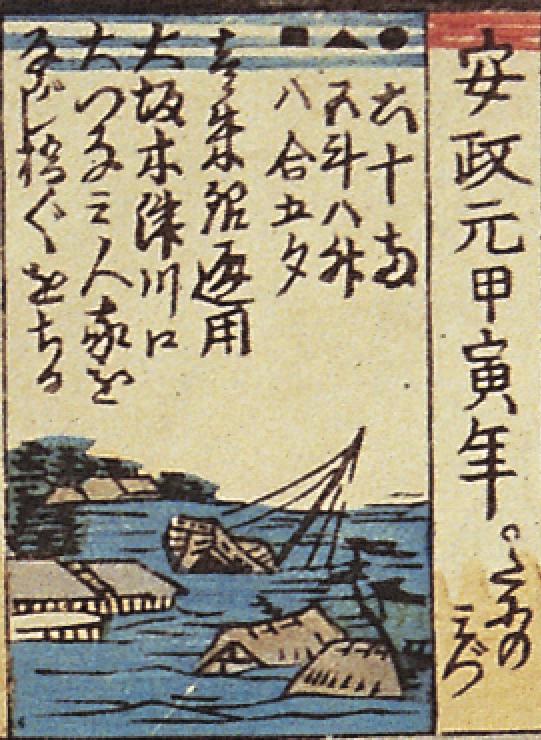 Kanagaki Rōbun also published an illustratred “disease documentary” on the cholera epidemic: Kinton Dōjin [Kanagaki Rōbun], Ansei korori ryūkōki, Tenjudō, 1858. Available online through the Waseda University Library Collection of Japanese and Chinese Classics here. For color illustration of coffins waiting in line for cremation, see cut 11. Bramlich-Oka, pp. 48-49. See also Minami Kazuo, Ishin zenya no Edo shomin, pp. 76-86. Matsudai banashi hakiyose zōshi, 1858. National Diet Library copy available online here. The Bukō nenpyō was in fact reporting on the appearance of Donati’s comet. Coming on the heels of the cholera epidemic, earthquakes, floods, economic collapse and foreign encouragement, the “strange star” was quickly interpreted as an omen of impending catastrophe, if not the arrival of the later days (matsuji). See Laura Nenzi, “Caught in the Spotlight: The 1858 Comet and Late Tokugawa Japan,” Japan Forum, vol. 23, no. 1, 2011, pp. 1-23. Connections between the comet and the cholera epidemic are discussion on pp. 3-4. Nenzi quotes from records of the Mito domain: “On top of this turmoil [including the cholera epidemic], an uncommon comet has appeared since the middle of the [8th] month. … Rumors have begun to circulate, and some argue this is a sign of disaster.” p. 4. Matsuji banashi hakiyose zōshi, vol. 2, p. 20 recto. Also see Bramlich-Oka, p. 57. Laura Nenzi, The Chaos and Cosmos of Kurosawa Tokiko: One Woman’s Transit from Tokugawa to Meiji Japan, Honolulu: University of Hawai’i Press, 2015. On the impact of Donati’s comet, see pp. 54-55. Bukō nenpyō, vol. 3 (ge), pp. 108-09. For a contemporary map of the fire, see the University of Tokyo Ishimoto Collection of rare books online. For image and short description, see Taiyō korekushon: kawaraban shinbun, vol. 1, Tokyo: Heibonsha, 1978, p. 68. See also leaflet that accompanied the 2014-15 exhibition of rare texts held by the Tokyo National Observatory: Kokuritsu Tenmon-dai Tenmon Jōhō Sentā, ed., Jōsetsu tenji dai 50 kai: Shisei no tenkō shiryō, available online here. Genji Yume Monogatari, p. 35. Bukō nenpyō, vol. 3 (ge), p. 120. Bukō nenpyō, vol. 3 (ge), pp. 111-13 for extensive details on the Aoyama fire. 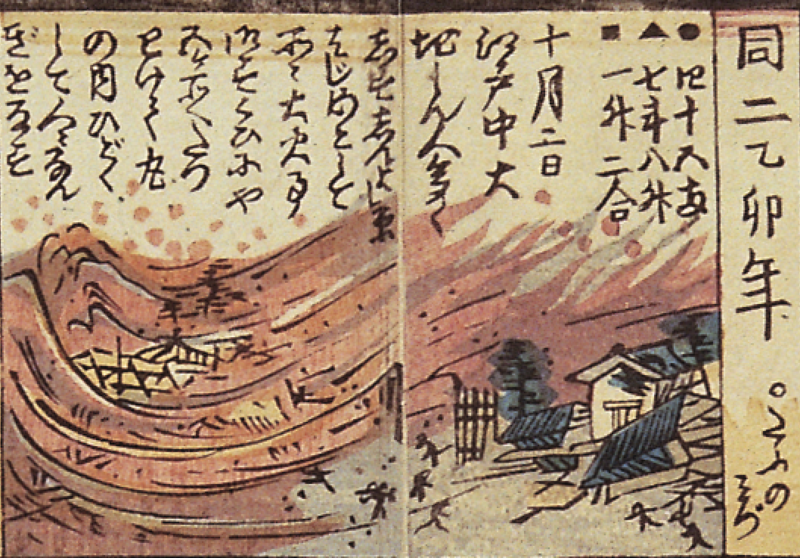 A broadsheet (kawaraban) of the Aoyama fire from the Ono Hideo Collection maps the extent of the destruction. On the 1862 measles epidemic, see Ann Bowman Jannetta, Epidemics and Mortality in Early Modern Japan, Princeton University Press, 2014, especially 124-139. On the visual record of the epidemics, see Harmut O. Rotermund, “Illness Illustrated: Socio-Historical Dimensions of Late Edo Measles Pictures (Hashika-e), in Susanne Formanek and Sepp Linhart, eds., Written Texts—Visual Texts: Woodblock-printed Media in Early Modern Japan, Amsterdam: Hotei, 2005, pp. 251-277. Bukō nenpyō, vol. 3 (ge), pp. 143-45. Minami Kazuo, Ishin zenya, pp. 83-86. Bukō nenpyō, vol. 3 (ge), pp. 143-45. On the visual record of the epidemics, see Gregory Smits, “Warding off Calamity in Japan: A Comparison of the 1855 Measles Prints and the 1852 Measles Prints,” East Asia Science, Technology and Medicine, vol. 30, 2009, 9-31. See also Harmut O. Rotermund, “Illness Illustrated: Socio-Historical Dimensions of Late Edo Measles Pictures (Hashika-e), in Formanek and Linhart, eds., Written Texts—Visual Texts, 251-277. Kuroki Takashi, Edo no kaji, Tokyo: Dōseisha, 1999, p. 4. Bukō nenpyō, vol. 3 (ge), pp. 178-79. For kawaraban map (and katsuji text) of the 4/11 fire, see the University of Tokyo Ono Collection. Bukō nenpyō, vol. 3 (ge), pp. 179-180. For kawaraban map (and katsuji text) of the 9-10/11 fire, see the University of Tokyo Ono Collection. Bukō nenpyō, vol. 3 (ge), p. 180. For kawaraban image and katsuji text of the 1868 Osaka flood, see the University of Tokyo Ono Hideo Collection. See the section on “Tokugawa Infrastructure in Decline and Crisis,” in Carl Mosk, Japanese Industrial History: Technology, Urbanization and Economic Growth, London: Routledge, 2016. Genji Yume Monogatari, p. 238. Quoted in Walthall and Steele, Politics and Society in Japan’s Meiji Restoration, p. 103. Soyofuku Kaze, no. 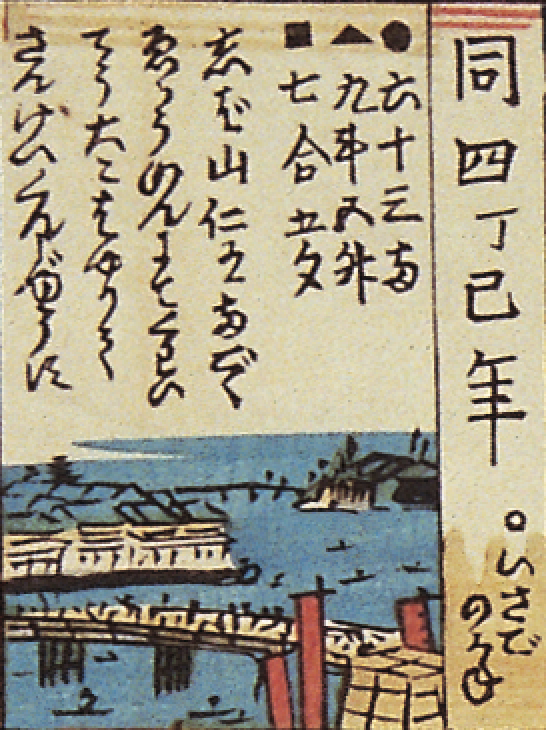 7, n.d., in Bakumatsu Meiji shinbun zenshū, 3, p. 408. 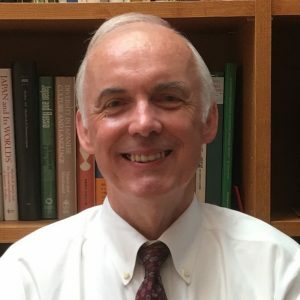 M. William Steele is Professor Emeritus at the International Christian University in Tokyo, Japan. He specializes in the social and cultural history of Japan in the late nineteenth century. He is author of Alternative Narratives in Modern Japanese History (2003). His recent publications focus on mobility and environmental issues, including the role played by natural disasters in modernizing Japan.